Submissions accepted from artists working in all 50 States for the third year in a row. Click on the image left to down load the brochure and entry form. Ink & Clay is a juried exhibit. Submit your best work by June 27th. 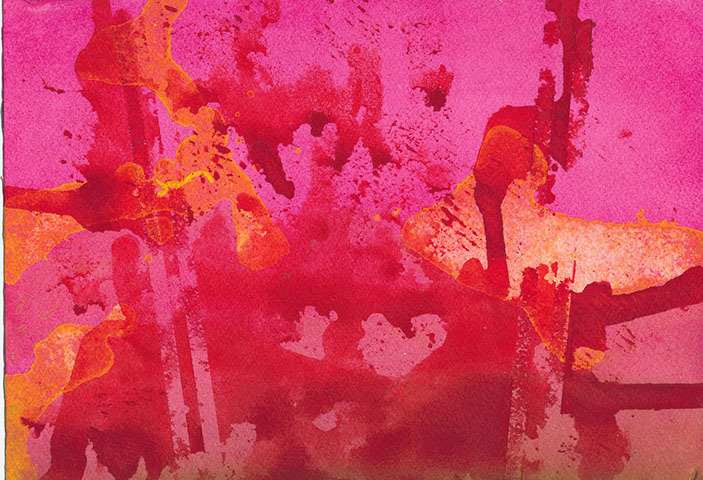 Established in 1971, Ink & Clay is an annual competition of printmaking, drawing, ceramic ware, clay sculpture and mixed media utilizing any variety of “ink” or “clay” as a material. 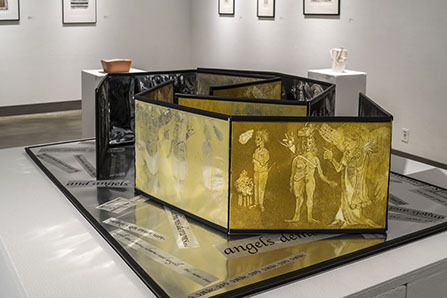 The exhibition is sponsored by the W. Keith and Janet Kellogg University Art Gallery of California State Polytechnic University, Pomona and is underwritten by the generosity of the late Col. James “Jim” H. Jones with additional support from the Office of the University President. For the second time, Ink & Clay was open to artists working in all 50 states, making this a National Competition! The exhibition is documented through an on-line catalog and a printable file. 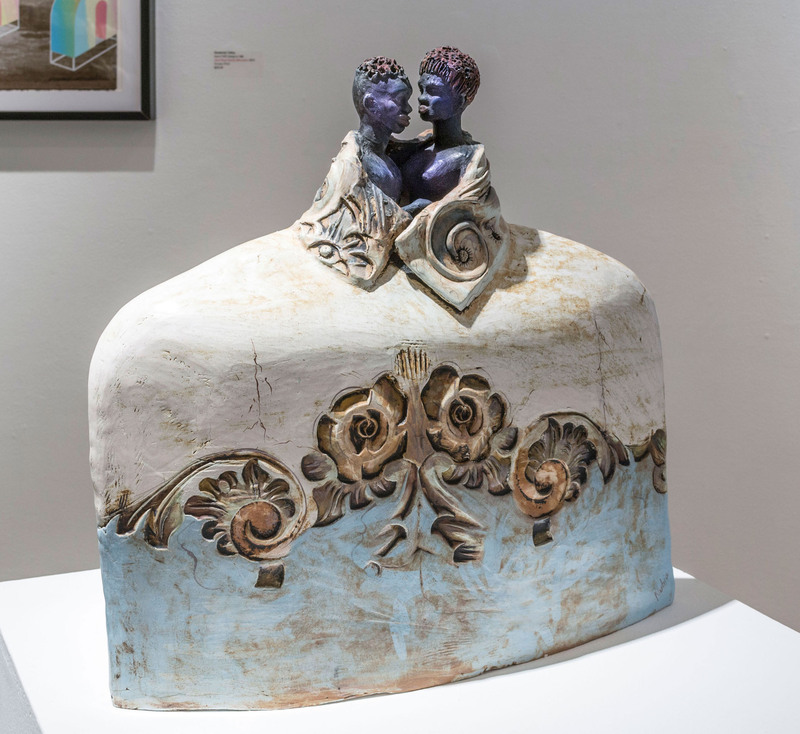 Unique among juried exhibitions, Ink & Clay is celebrated by artists and collectors for its quality and diversity. View the individual clay art works and artists statements by clicking on the names of the artists in the list below. 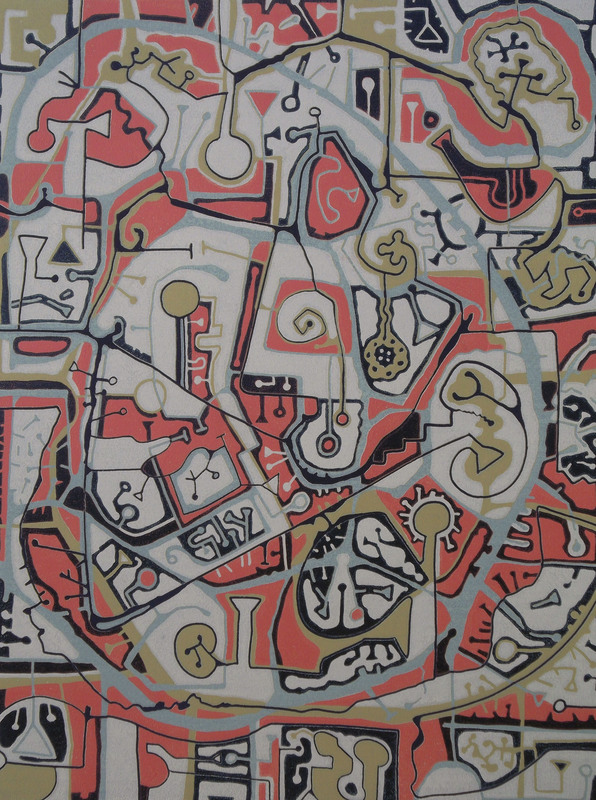 Many of the works can "zoomed" into by mousing over the image. These mono-stereographs are of drawn figurative imagery juxtaposed to non-specific photographic spaces. 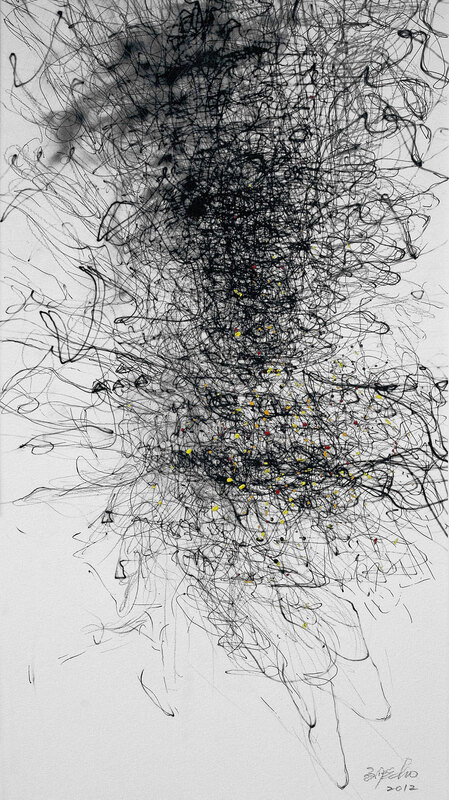 The drawn content is selected and privileged marks and gestures of physical interaction, memory entwined within the fibers of the silhouetted garments. 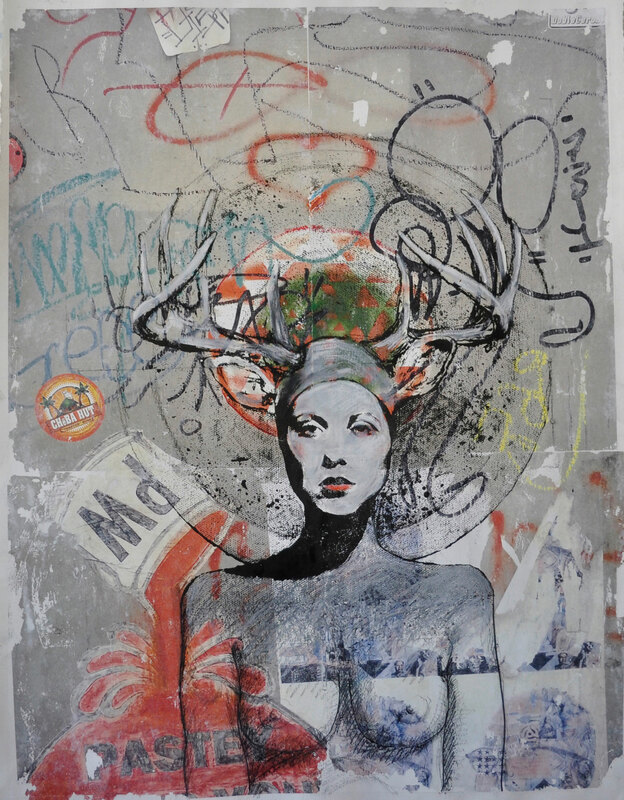 This work investigates associations of different spaces to objects, specifically clothing, that define culture of class, gender, and time period. Ambiguity can open up more analogies to ideas of what constitutes inside and outside, remnants and detritus, constructed and accidental. The motivation comes from a desire to understand the confinement of boarders through the seemingly molecular aspect of garments in space, or marks of memory in a photographic image, and the inexhaustible variability of chance. My recent prints are the culmination of 30 years of diligent searching and experimentation to find processes that will allow the combination of my digital photographs , drawing, and printmaking and integrate them into one coherent image. Finally I feel as though the images are my own. They are no longer referential to other artist's works besides some of my heroes. It is as though my voice can now be heard through my imagery. The images relate to my fascination with the archetype and women and a personal iconography that has developed over the year. My work over the last 10 years or so has concentrated on creating what I hope are visually interesting, abstract images derived from the symbols that anthropologists use to delineate kinship and social structure. 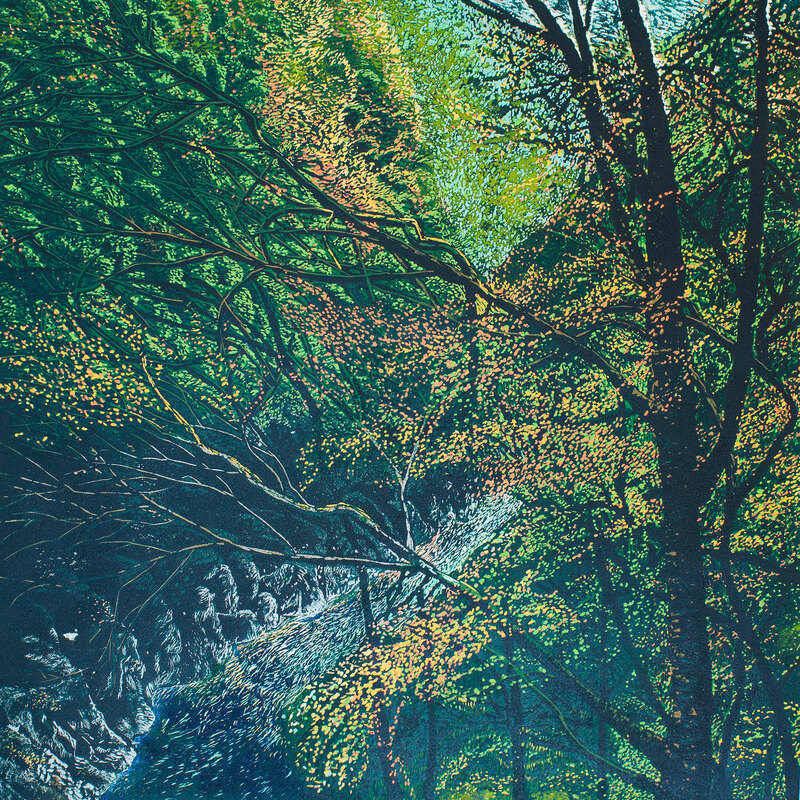 Nature provides an ever-changing and fascinating subject for my artwork. The myriad colors displayed by nature and its creatures inspire me to create art in the attempt to evoke in the viewer the same emotional response it creates in me; feelings from peace and a sense of wonder to excitement, even exhilaration, based on the coloration of foliage and flowers. My garden is a large part of my world and it is filled with color, shapes, and textures which changes from season to season; I have only to step outside my house to discover an idea for my next print. The wonder that comes from planting a seed and tending it from sprout to blossom is almost indescribable. It is a journey, much like creating art, as it is full of possibilities and an uncertain outcome. What adversities must be overcome; will it thrive and meet its full potential? It is with the intent of sharing this excitement and joy that I create my artwork. Although my artwork is mainly considered representational, I deal with more metaphorical aspects rather than realistic physical evidence. The human body along with other elements: garments, fruit, vegetables, furniture, animals, etc. have been my focus. The images bear a slight resemblance to traditional Japanese Ukiyo-e prints, but also express contemporary aspects of the Western Hemisphere. The enigmatic figures I draw are reflections of human conditions such as; wry, satire, whimsy, irony, paradox or the mismatches that happen often in people’s daily lives. My figures also employ a state of motion or movement suggesting an actor/actress who narrates a story in a play. 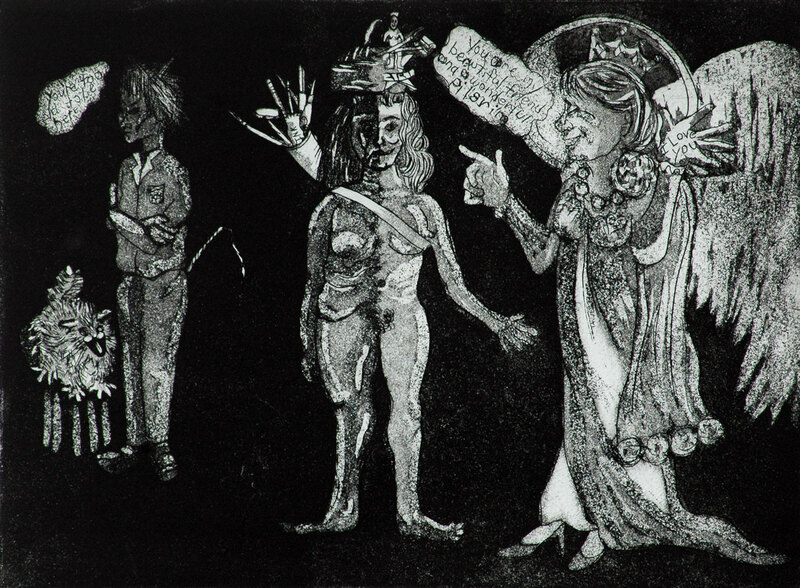 The images in my intaglio prints in this exhibit are little figurines in action. They are cheerful, joyous and restless. They are all happy people. I have been taking my theme “Dialogue with Nature”. All the time Nature inspired me with courage. I was touched my heart by trees controlled under the influence of nature. 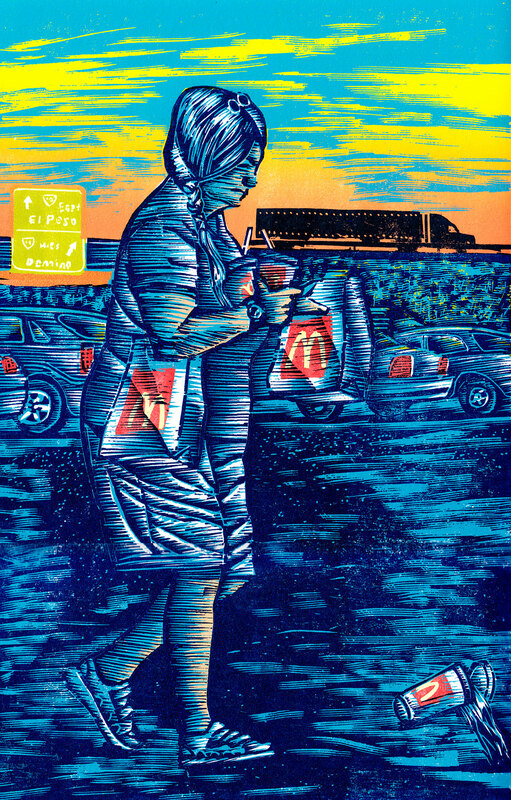 Under this theme I use Reductive Relief, Linocut. 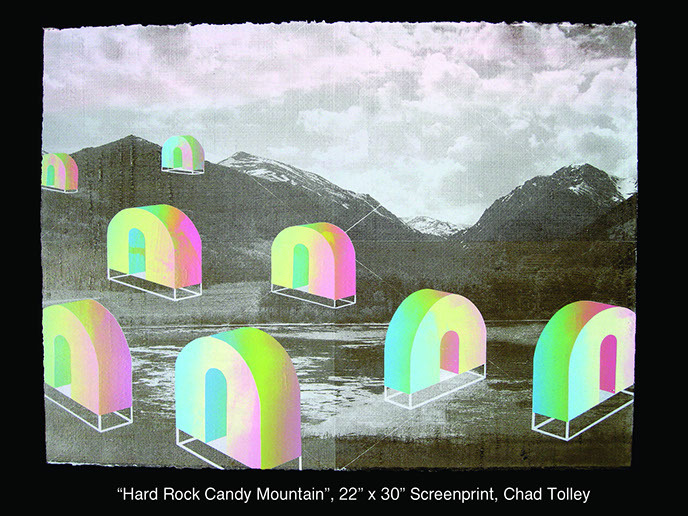 My prints have been made from a single block that has had progressively more of the surface removed as each color is overlaid. The first color to be gouged out was the white, wit.h light color (E.g. yellow) being printed over the rest of the image leaving the white paper where the block has been cut away. 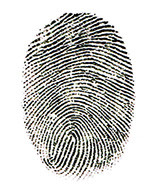 The second stage was to gouge out the areas to remain yellow and print the rest of the image in next color (E.g. green). I then removed all the areas to remain green and printed the rest in darker color and so on until finally there was very little of the block left for the final color. At the end the block was destroyed, then we call this technique suicide print. 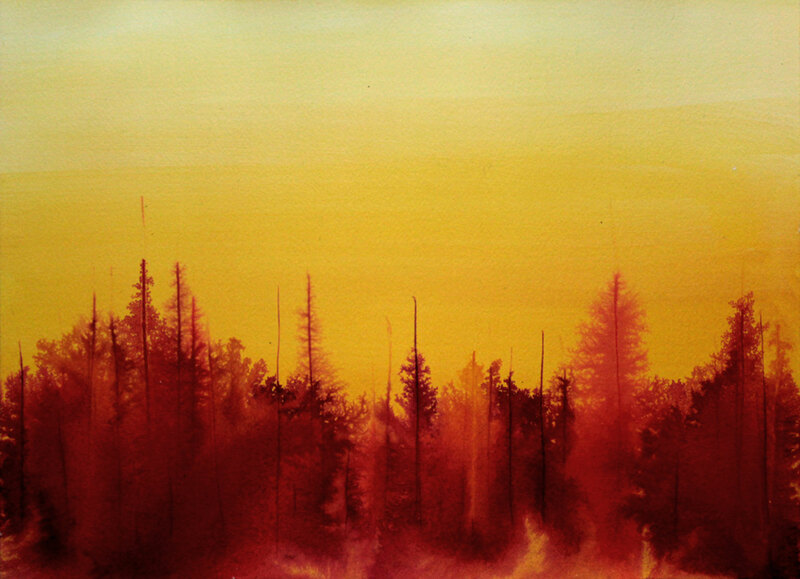 Although I am primarily trained to work in paint, using ink and acrylic medium opens up a range of visual expression that I could not have accessed otherwise as a painter. Ink has become an integral part of my process, and its ability to disperse into organic textures that can be as detailed as diatoms, or as nebulous as interstellar clouds, evoking dynamic visions of other worlds. In depicting these worlds, I employ atmosphere and abstraction to explore mysterious landscapes that suggest aspects of time, history, and memory, and the sublime power of Nature. The focus of my work has always been to depict something about the American experience, no matter how ordinary, and to say it in an aesthetic manner. The enjoyment of color, composition, and consideration of tactile surfaces all need to marry with the content. That being said, I sometimes will create a piece for its pictorial qualities in and of itself, sometimes for the technical challenge a visual idea may pose. Elements of the way things sound and smell are also meaningful to me. Visual images should bring about the “at onceness” experience that we all know and understand in an instance. I have been drawing for twenty-eight years. In my Zen Buddhist meditation practice, the lines bend like a reed in the breeze, or soar freely as a bird above a cliff, thousands of lines dancing in my mind. The inner world is clean, clear and full of fresh air. Thousands of lines move as a wave. The secrets of the universe are revealed. Music, especially classical symphony, also shapes these visions. I draw the feelings the music brings forth, the expansive sense of flying over mountains, rivers, and oceans. I have been an abstract drawing artist for many years, concerned with line, shape, composition and concept. The meditation allows me to expand creatively while using an ultra-contemporary art forms with limitless potential. Drawing for me is an experimental adventure, a profound form of play. In this series Fragments Geometry & Change, compositions are based on geometry and change, in color, value, temperature, or intensity. These changes can be seen as the eye moves from top to bottom, bottom to top, or from side to side. Through this process I can explore simultaneously the mysterious spaces between inside and outside, color field, and image, figuration and abstraction, two and three dimensional space, and because of its simplicity has immediacy and spontaneity that is distinct. Louise Bourgeois wrote in her book Drawings & Observations: “I am interested in cars because they selfpropel themselves for reasons that are reasonable and mechanical. So this is it: How am I going to be selfoperating all by myself.? Well,I can do that if I can invent something that keeps me going.” These are what I have invented to keep me going. I have always tried to express my feelings of being part of the current time, particularly technology and science as it relates to art. I have become totally engrossed with symmetries as a way of expressing myself in many different mediums. What I like is that they are abstractions that mimic life. It is one image that replicates itself and becomes a more complete image. As soon as there are two sides of an image it becomes organic and recognizable. While I enjoy doing the work I also think the viewer becomes engaged with seeing the work and puzzling out recognizable forms as in Rorschach’s. This drawing is done in acrylic and then I use ink washes to get the effect that I want. The hands on approach is my response to the digital work that I do. I have recently been working on a series of prints called Mangroves on the Edge. Mangroves are “on the edge” in more than one sense. They grow on the edge, between land and sea, where they form a protective barrier and habitat for all kinds of life. They are also on the edge of survival, because they are threatened both by human development and by climate change. 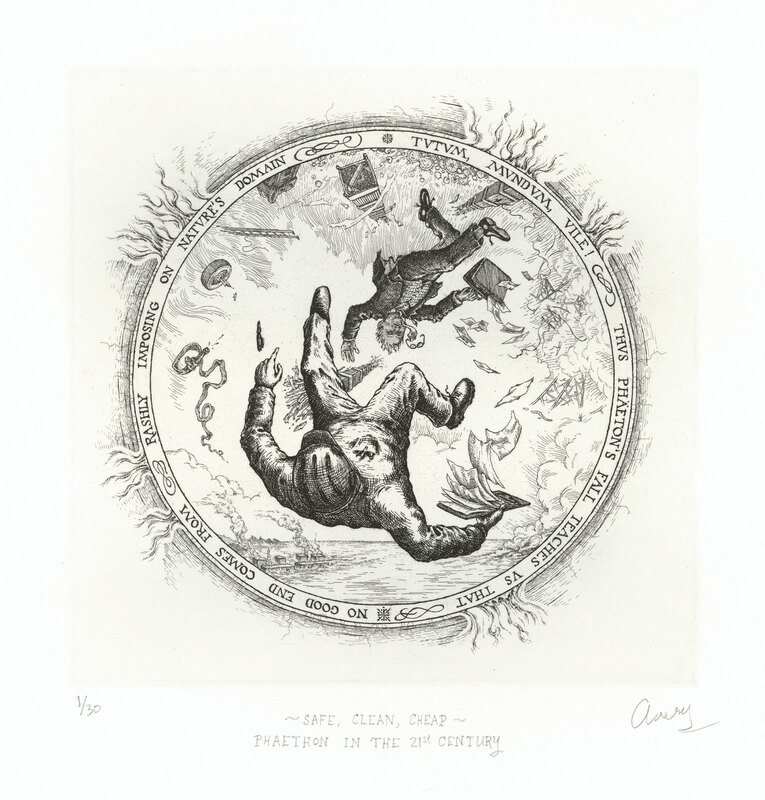 These prints combine solar plate etching, drypoint etching, and ink drawing. The solar plates are made in various ways, from drawings on acetate, from digital photographs, and by direct exposure of leaves and other objects,. 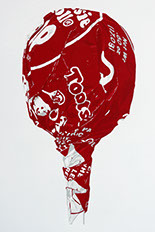 Hand drawing is added after printing the solar and dry point plates, so that no two prints are identical. My work is inspired by vibrant colors in nature and some of my imagination. I often get ideas from photos and use my ideas and drawings to finish my work. 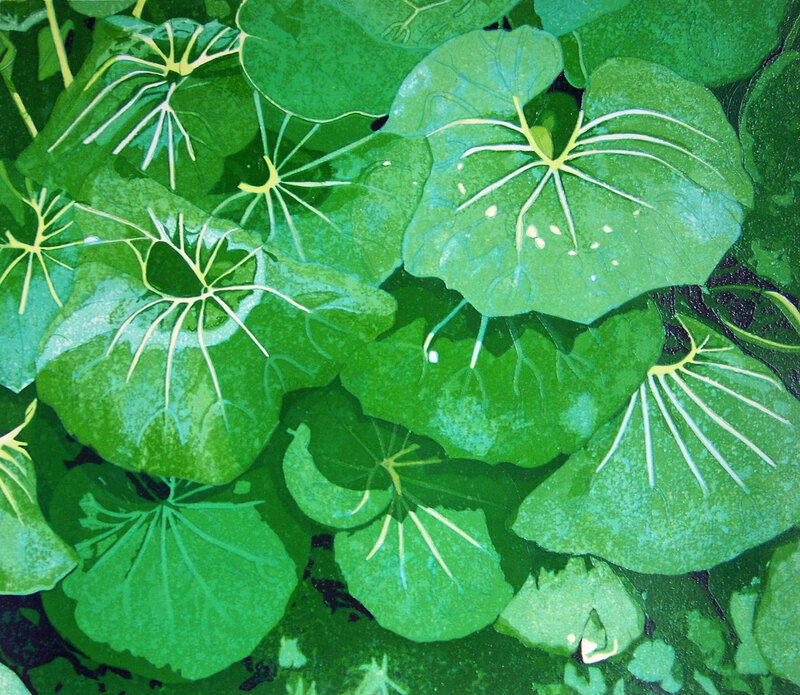 Some of my wood cut and linocut prints are my imaginary flowers and gardens. 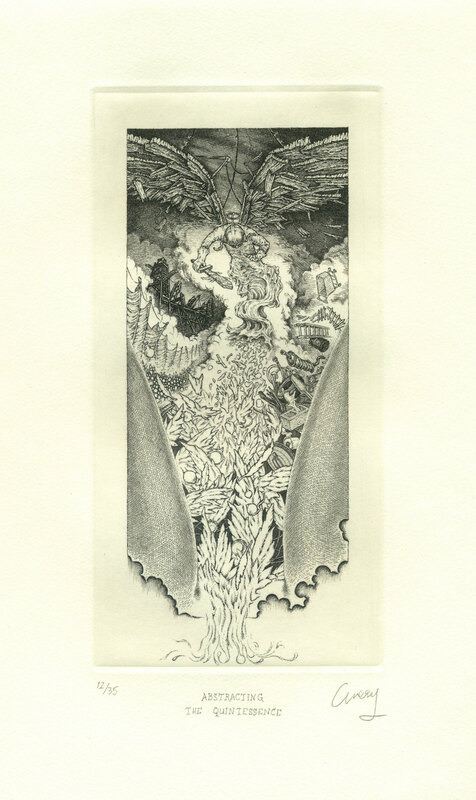 Some of my etchings come from my Indian heritage. 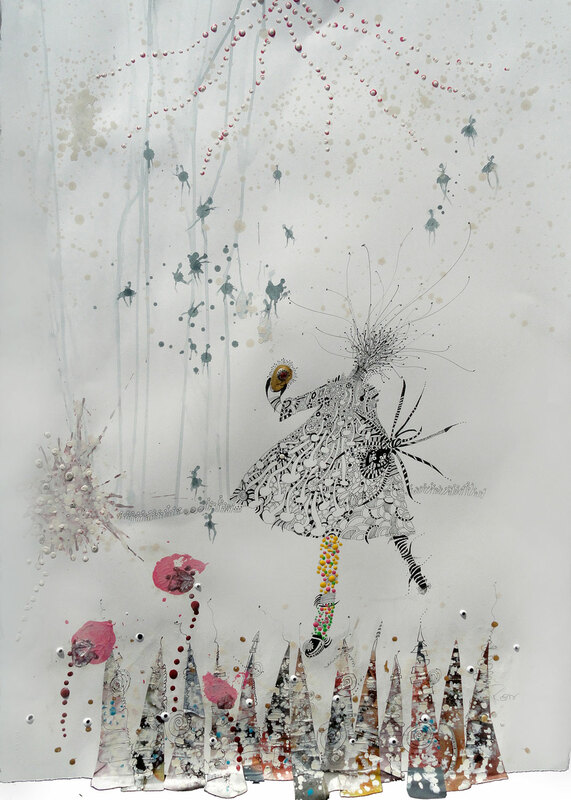 My mixed media work is narrative, telling a story that you the viewer can personally interpret and create. Many of the images are from my own history and symbology but each completed work becomes a world unto itself, the photos referring back to the original source but now in a different situation making new metaphors with drawing and mark making. So • ka • ty is a compilation of 3 young artists based out of Southern California. 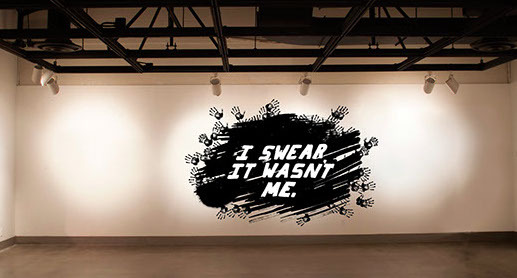 This is the first time they have joined forces to create collaborative installation work. Their combined backgrounds include studies in graphic design, architecture and apparel. 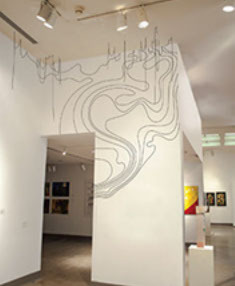 They love creating large-scale works that transform a space into an experience to be had. They have created individual works but found that collaborating for this year’s Ink & Clay was a fun and very creative process. 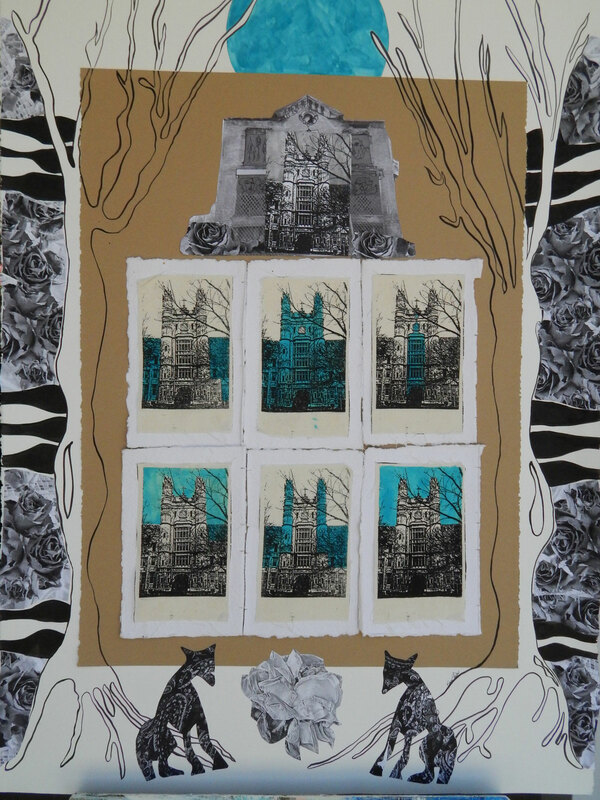 This is the first time So-ka-ty has submitted work to a juried show. The contemporary American Experience is a consumer driven environment in which our values are deceptively advertised as wholesome qualities of The American Dream. Concepts of packaging, branding and marketing have permeated our culture and language where interpersonal relationships have become commodities within social media to define status. My current work involves colliding images and techniques producing a new piece with content each individual component does not possess on its own. 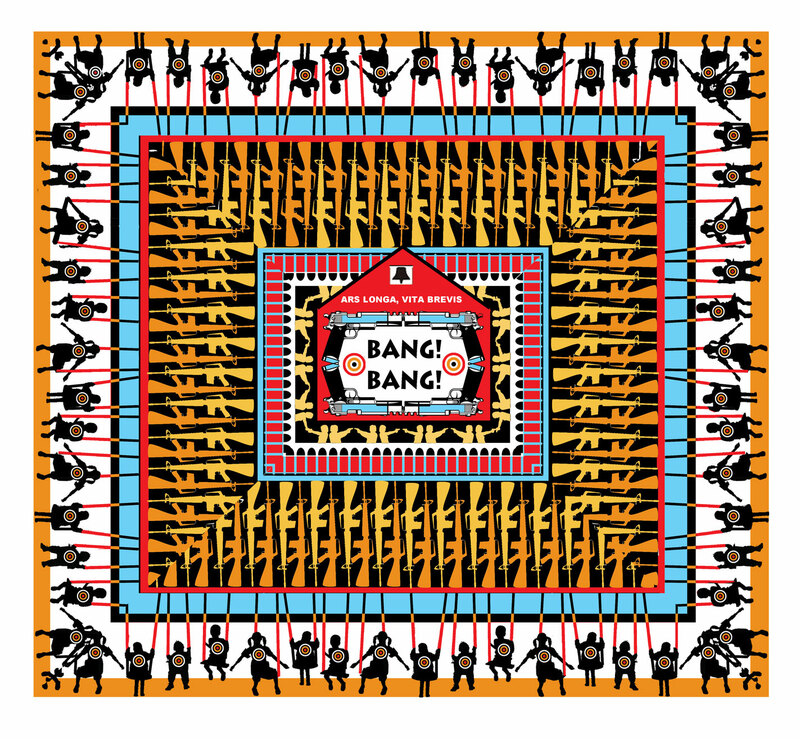 The conceptual and visual contrast expresses the divergent forces that shape the American Experience. My work begins as a process of collecting. I collect photos, textures, magazine clippings and notes from personal observation. Most of these materials are assembled together in my sketchbook to create a sort of log book. 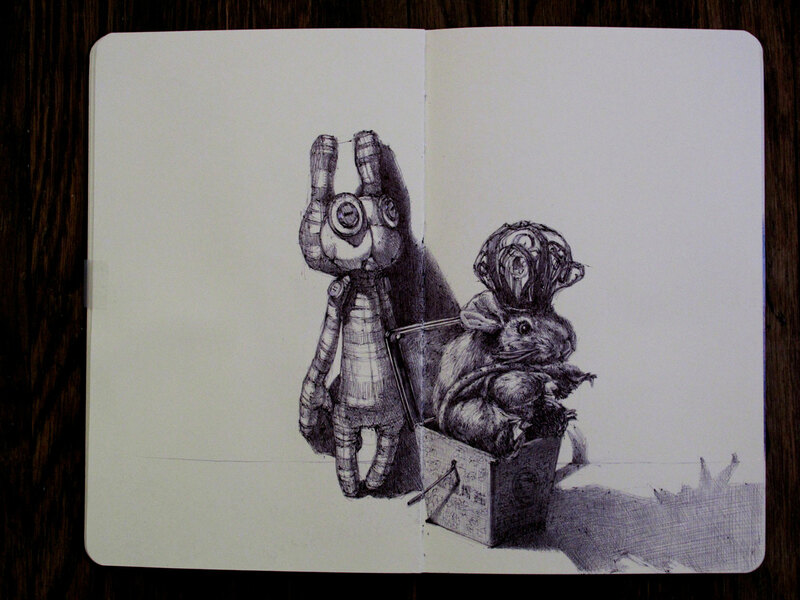 It is in my sketchbook that I process ideas and create drawing assemblages from which I develop prints. 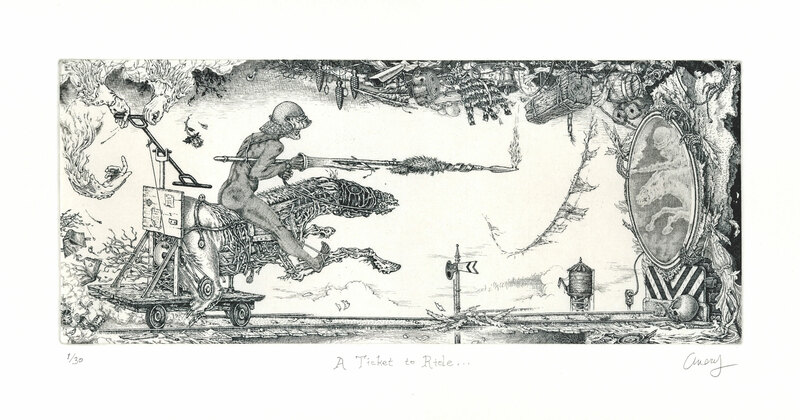 My drawings and prints are filled with visual metaphors that suggest a narrative. 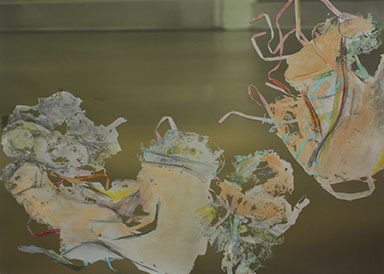 Each narrative is an intuitive response to material accumulated through observation, introspection and visual mapping. Though I do not intend to create autobiographical work, I often use my personal experience as point of reference. My hope is that the final image will have enough information to suggest meaning but ambiguous enough to allow for personal interpretation. In my studio practice, I use a computer to repeat images that I stitch together visually in order to make an appealing pattern, often resulting in tapestry-like, spatially flattened compositions. 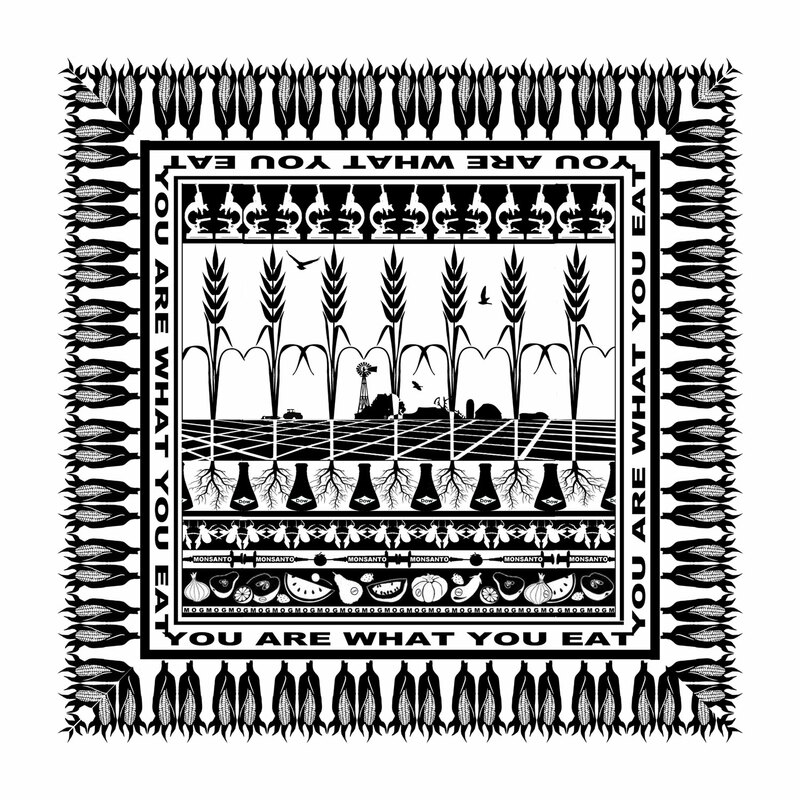 Through decorative patterning, the work of art draws the viewer into a slowly unfurling narrative that invites a discussion about ecology and/or sociopolitical realities of the contemporary world around us. Meaning is implied by the juxtaposition of images. Conclusions are left to the viewer in the hope that a continued questioning will be inspired by the work of art. View the individual clay art works and artists statements by clicking on the names of the artists in the list below. 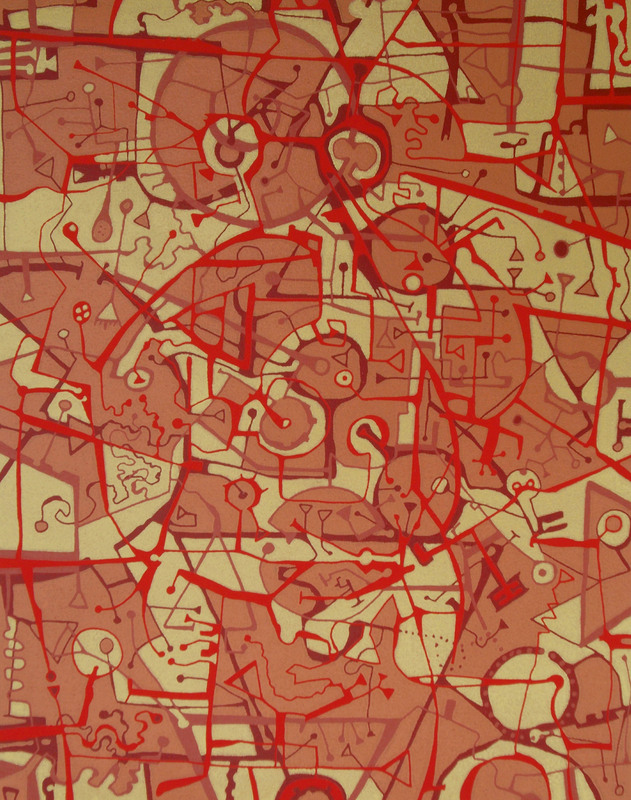 Many of the works can "zoomed" by hovering over the image. A mountain ridge, clouds, the bark of trees, sea creatures, a rock wall, ripples on the lake, skyscrapers and Romanesque buildings – these are just a few of the things that intrigue me. I try to recreate my impressions of them in clay, but at the same time being careful not simply to imitate them. I explore and experiment with form, texture and color to come up with something that is my own. 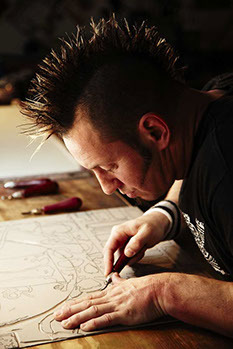 I hand-build all of my work, and plan to continue to create pieces that have an organic feel or architectural elements. It is exciting and humbling at the same time to realize that there are infinite possibilities in working with clay. Caroline Blackburn, based in Los Angeles creates vessels that explore her interest in abstract painting, architecture, fashion, and nature. Trained as a painter her work focuses on bringing a freshness and immediacy to each piece through color, form, surface, and texture. 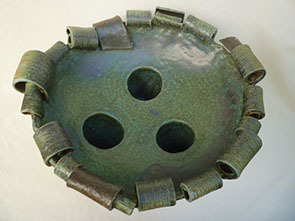 Every work is highly considered whether it is thrown on a wheel, hand built, or a combination of both techniques. 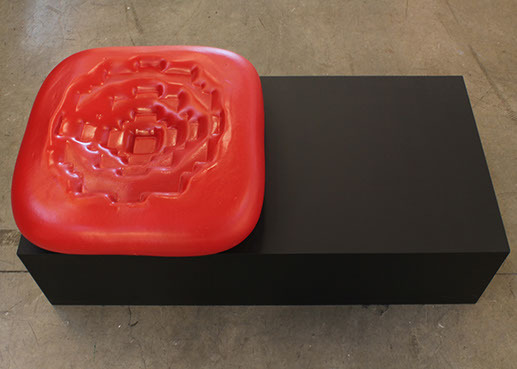 While investigating an interest in plasticity the work produces a continual shift between surface, texture, color, and object. Each vessel provides a contemporary sense of life that is very personal and universal at the same time. 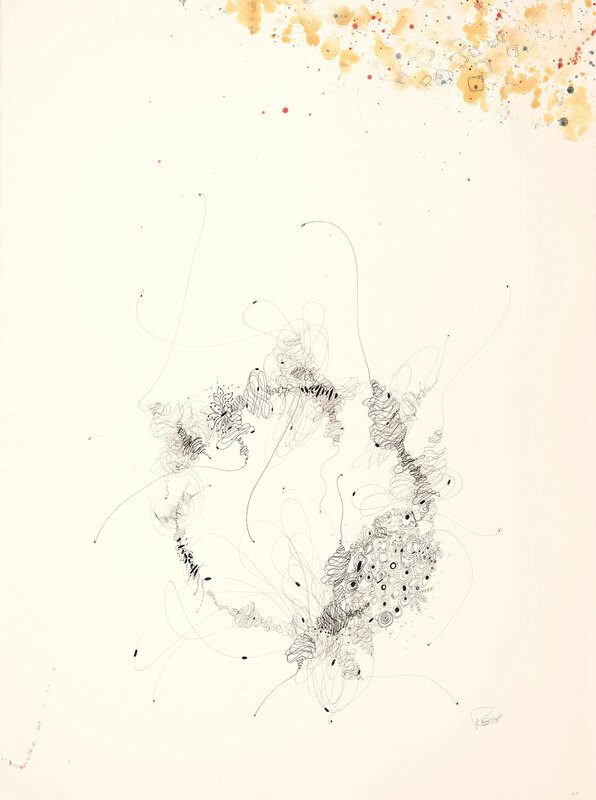 Caroline received a MFA from Art Center College of Design and a BFA from Boston College. As an anthropologist and visual artist, my field work in ergological folklore took me to different groups of potters not only in my country but also in Chile, Mexico and Haiti. I was affected by the same simple vessels that were used in everyday life and for religious rituals. Their use of Raku, Saggar, Barrel and Pit firing fascinated me. Their vessels were more than just pots, they told stories, and they were timeless and universal. 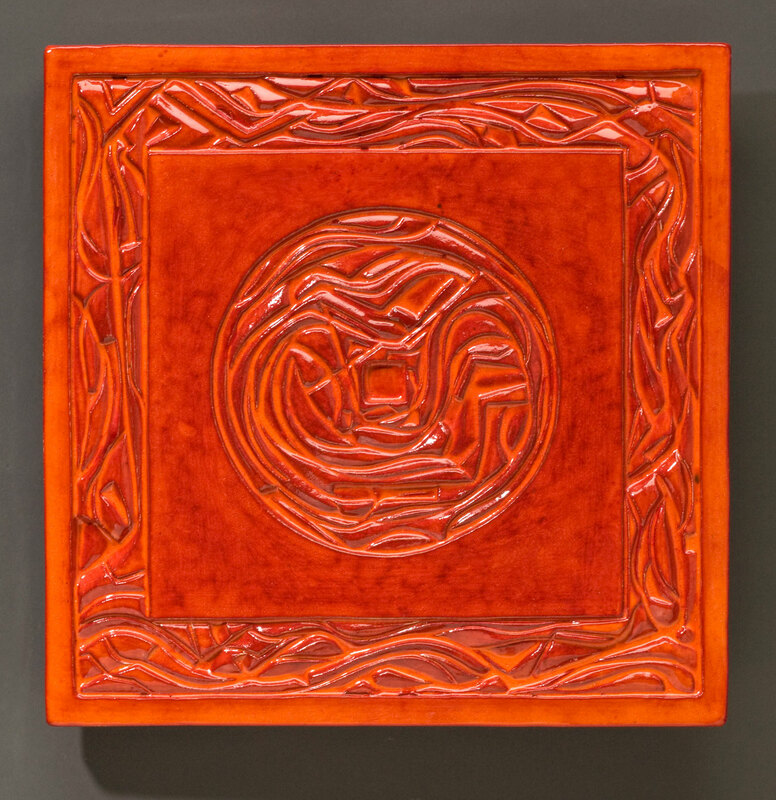 I have always derived pleasure from creating something with my hands; my work derives from my passion with clay, the simple forms, the playful parts, the subtle balance and contrasts in color and texture. My ceramics contain a short history through their creation and production process, every piece has its own origin and evolution, its own story full of symbols and contrasts. 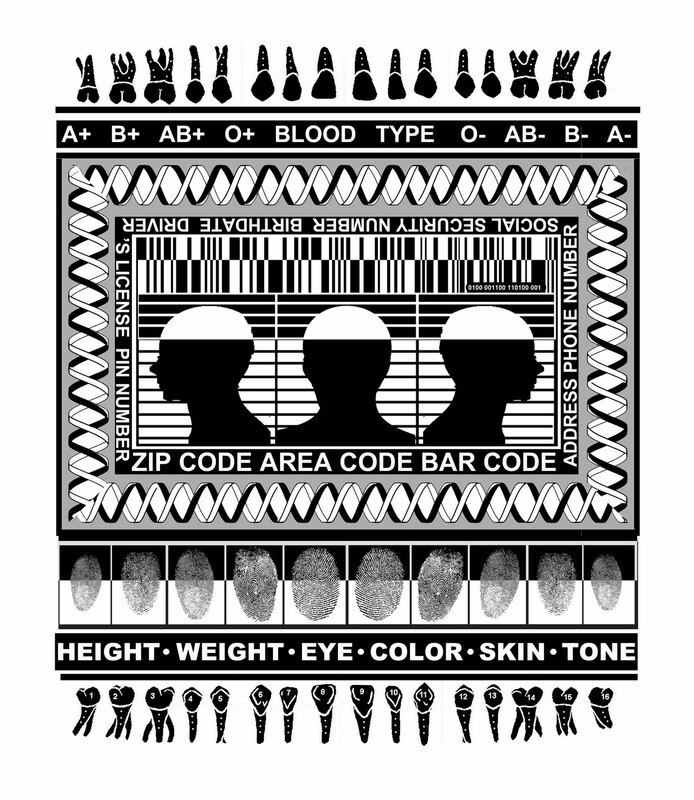 My long trajectory in the investigation of indo-Afro-American groups has given her the opportunity to develop my unique style in the design of my artwork. The act of making work and the final product are both equally important aspects of my art. I enjoy slow processes which allow me to meditate and get lost in my thoughts through the tedium while my hands stay busy and moving. 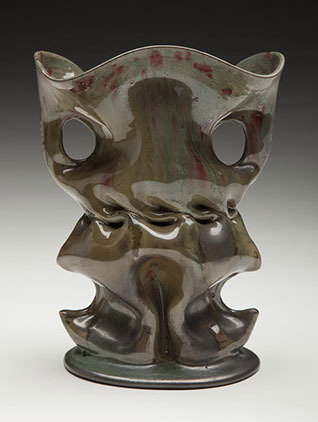 My ceramic works typically portray a more abstract approach of processing emotions. The “scroll” or tubular pieces I create are dealing with the themes of loss, fragility and letting go, as well as strength and rebuilding. These pieces were created after witnessing the death of somebody in my life as a way of dealing with that sense of loss. 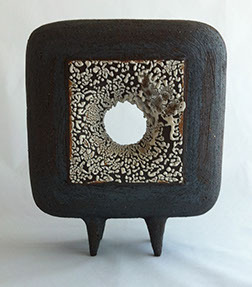 The organic inner-skeleton of these pieces are burnt out and turned to ash in the kiln. Left behind is a hollow and fragile shell of porcelain, which is significant in capturing that moment where that inner essence or “soul” is lost. In these pieces, the process becomes the product. I enjoy the process of working with clay to create vessels, then decorating these forms with patterns that I design and hand cut. The original inspiration for my designs was the Hawaiian Quilt patterns which are based on the flowers and plants of Hawaii. In recent years I’ve looked to both international designs and nature for inspiration to create patterns. The result I strive for is to make a piece that is both beautiful and functional. In 1974, one of my professors at Cal State Fullerton required those of us in his graduate seminar to write a personal statement about their artistic philosophy. I did not keep a copy of mine, and all that I can remember is my last line, a quotation from Dante: “Do as the Divine: create.” At the time I was not conscious of what I (or Dante) meant by that, but it was an urge that I deeply felt. Forty years later, the meaning is clearer. It’s about doing what comes naturally, about playing, about potential—following thoughts and impulses,seeing what happens if I try this or that, and taking a ride to somewhere unknown. It’s about learning how to stand out of the way and let the process take over. It’s a journey with no destination that brings the soul near. I would never have imagined that I would be making the things that I make. 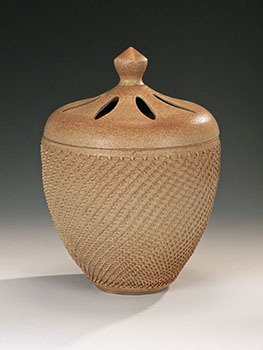 George Ohr, the Biloxi potter,wrote at the turn of the century: “Clay follows the fingers and the fingers follow the mind.” I’m happy that I have worked and lived long enough to develop the skills needed to create these objects. And the neurons are still firing too. I am intrigued by the mystery of meaning that I find in ancient art, much of it in ruins, found in Mexico or other places in the world. In my art I attempt to capture that mystery, that “eternal presence” of ancient art forms, which elicit particular emotions in me that may be universal and timeless. My intention is to create art forms that bring the eternal presence of the past to the present, to inspire reflection on contemporary time and place. Although my work takes different forms (small table top constructions, tall columns, large wall hangings or oversized heads) my intentions remain a constant. 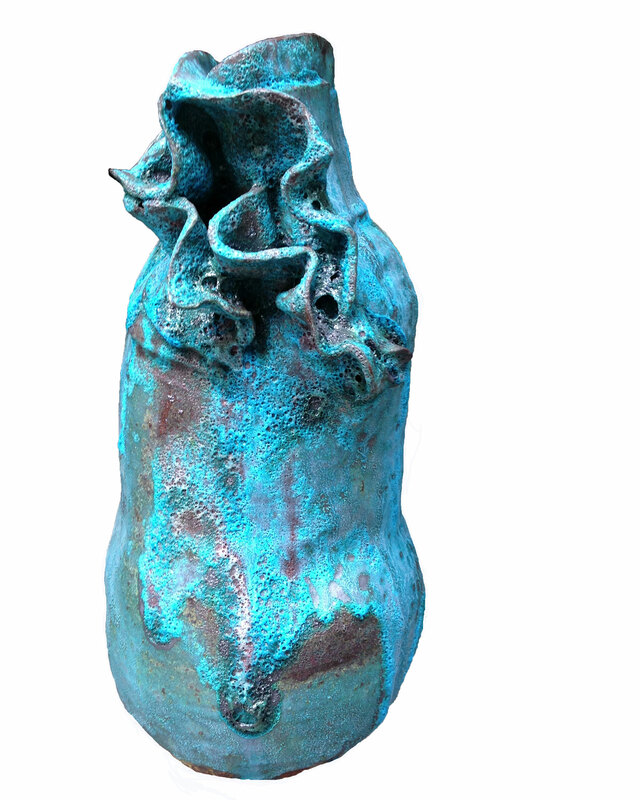 The catalyst that propels my work to take numerous forms is my desire to explore my primary medium, clay, in varied and technically challenging formats. My use of organic and geometric motifs is rooted in my belief that these forms are a universal language that is timeless-- linking the past and the future and cutting across cultures. I make sculpture to express my thoughts about life. The more universal the elements the more I use them. The narrative that I create by adding these elements together is open for interpretation. Although I may see the sculpture in a certain light, the viewer may have another point of view and this is good. I love working in red clay because of its color and mention to the earth. Sky and water are referenced by the use of turquoise and shades of blue. 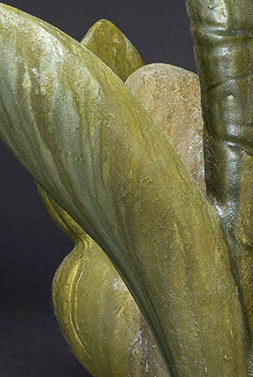 Brighter colors describe other surfaces of the sculptures that I subdue with more earth tones. I use textures and the marks from my hands to build a rich surface and give the sculptures a fossil quality that adds to the narrative. I enjoy the freedom I have when I am making choices and working in clay. A good day in my studio happens when I am in succinct with my decisions. I work in series so that I can explore more possibilities with one idea and not feel I need to get it right with just one piece. Trial and error and a lot of looking are a big part of my routine. Recently, I have been using animal forms in addition to the human faces in my work. 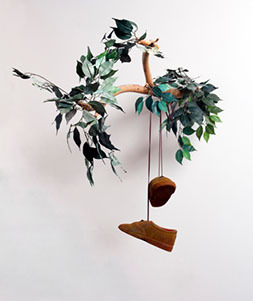 Consequently, these sculptures are more playful and odd depending on the animal I have chosen. I think of these animals as personalities that we know and identify with. An Orchestrated Comfort is an installation of an imaginary environment that has been created through the use of various media. 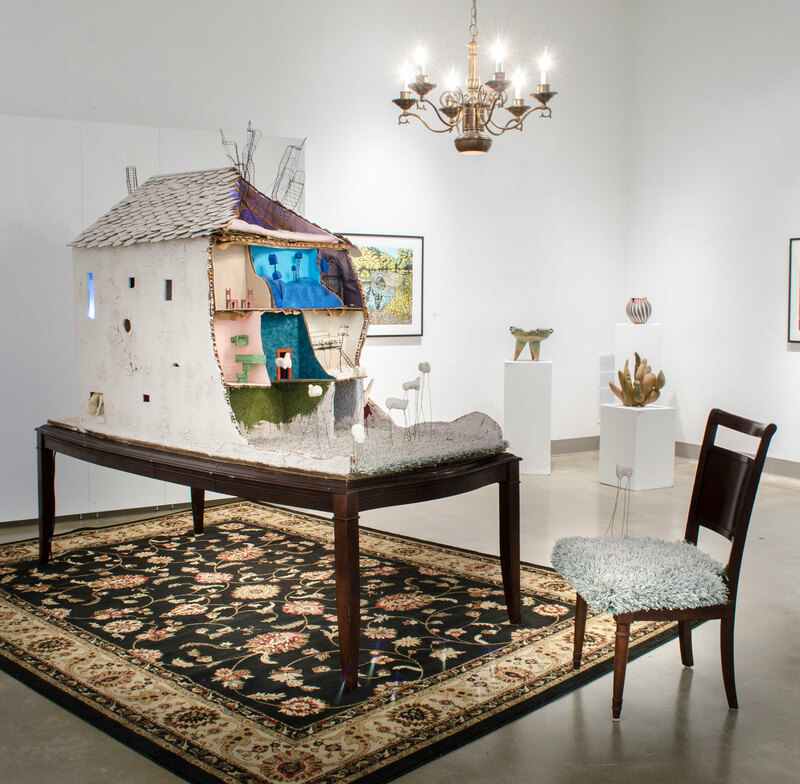 The doll-like house is meticulously constructed by the artist. Filled with memories, dreams and longings, it explores the entanglement of imagination and the subtle need of control within it. amended by the manipulation of the imagined. Pyrometric is an inter-disciplinary collaborative project that represents the intersection of artistic and ecological processes. 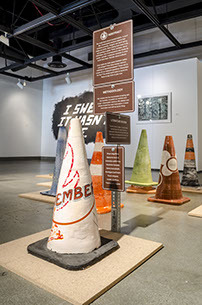 The installation is comprised of ceramic traffic cones and integrated graphic and textual representations of scientific and pseudoscientific approaches to chaparral fire ecology. Some of these cones are intended to be “chaparral fired” in the Southern California landscape thereby alluding to Orton pyrometric cones. 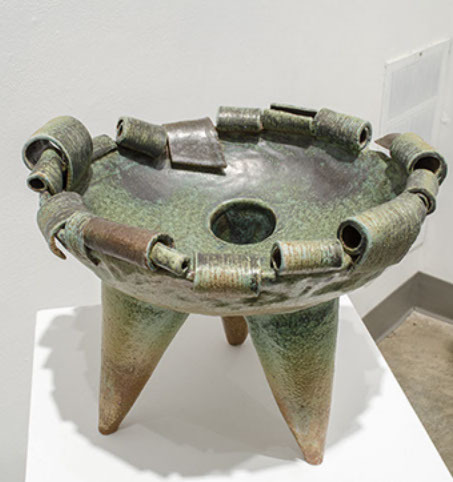 Others are fired with a dusting of ash gathered from previous fires not only to emphasize the cyclical nature of fire in Southern California, but also reference the importance of ash glazes in the history of ceramic arts. We learn from the example of the “tsunami stones” of Japan—inscribed slabs erected beyond the reach of previous catastrophic tides with warnings to the future: “Remember what happened here and do not make your homes below this point.” Art can mediate between people and nature. 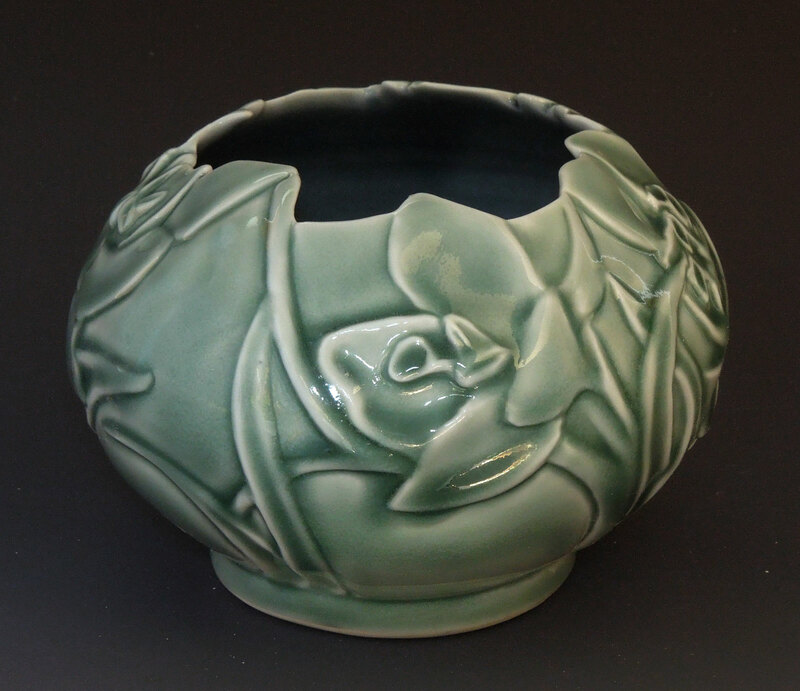 Our chaparral-fired ceramics can help calibrate human memory to natural processes. I throw classic forms and use surface textures to give them energy and vitality, resulting in art that is both pleasing and alive. I seek to create patterns and textures that emphasize the organic interplay between order and randomness as found in Nature. 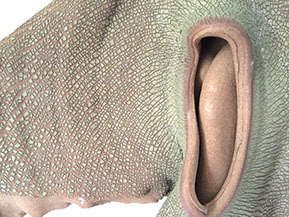 The tactile feel and visual look of surface textures are essential to my pieces. 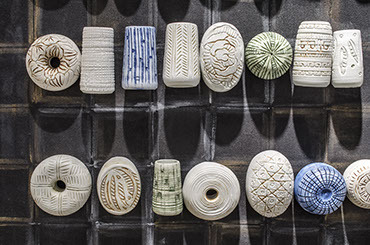 I create textures by deeply impressing patterns into thrown cylinders. Then, working from the inside only, I expand the cylinder to create the final form. 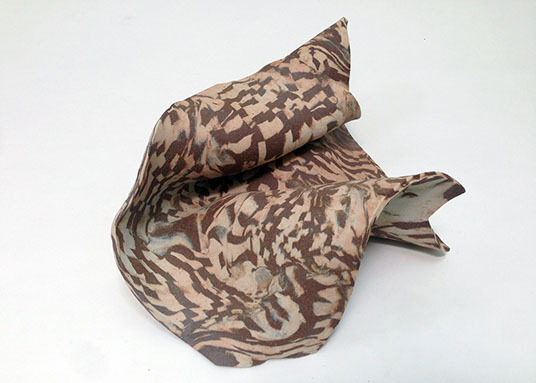 This technique allows the pattern to evolve as the clay twists and expands. 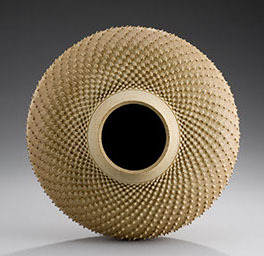 As the pattern adjusts to the shape and function of the vessel, it becomes reflective of Nature’s adaptation to form. My glazing process enhances the natural aesthetic of the order and randomness. Thinly glazed surfaceshighlight the macropatterns and reveal the stoneware clay’s micro-texture created during the expansion process. I often use multiple glazes to intensify the dynamic tension of the surface. My goal is to pursue the interplay of shape, surface texture, ordered patterns, and random effects so that work is created that intrigues the eye and demands to be touched. Although my work is functional, it is often prized as decorative. I’m a sculptor, potter who likes to mess with traditional ceramic forms and blended them with non- traditional elements and ideas. 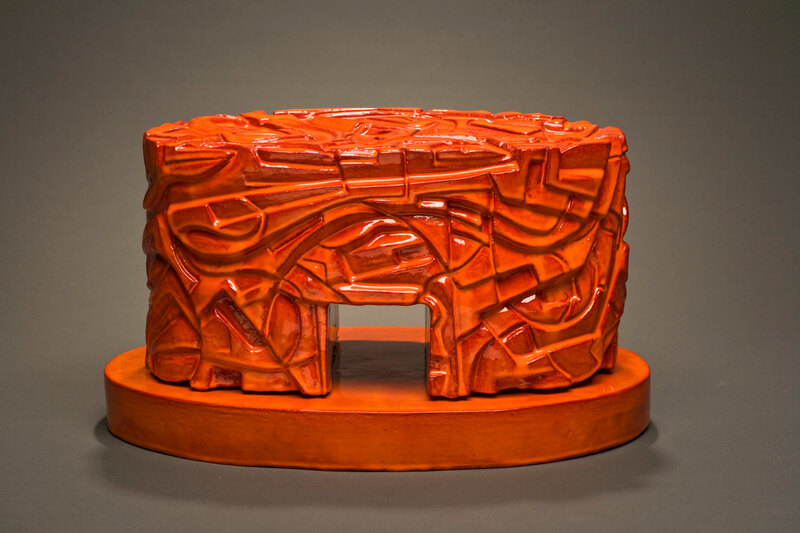 This body of work incorporates a combination of traditional thrown forms and abstracting them. 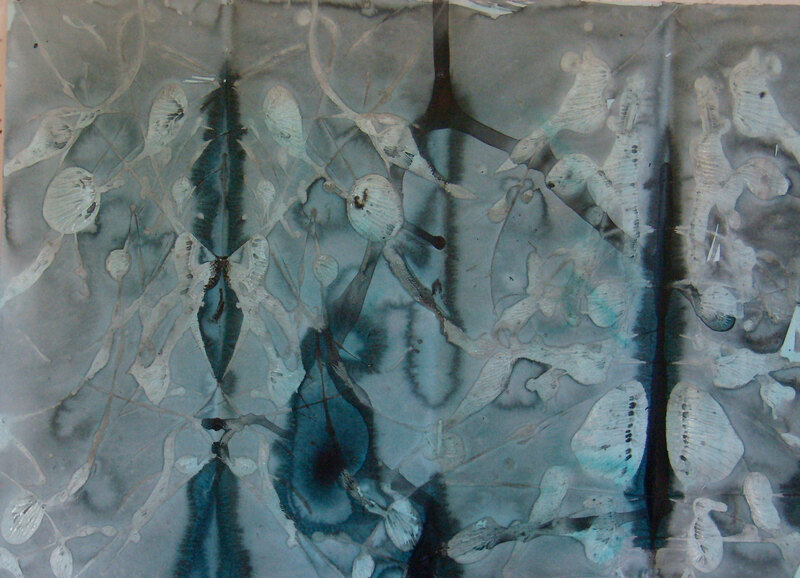 I then use both traditional nod non-traditional techniques of overlapping glazes. 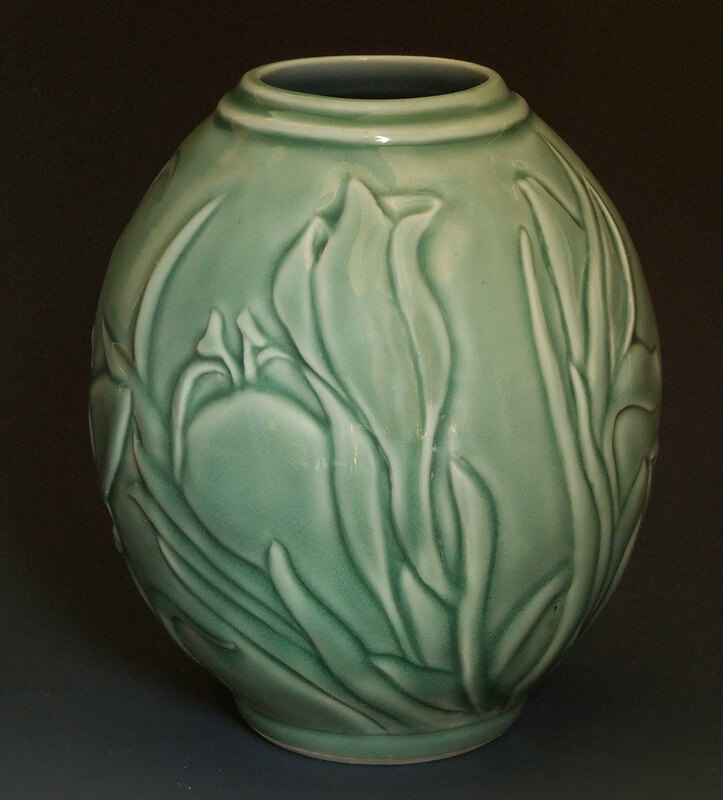 The techniques range from high temperature to complex low fire luster glazes. I have recently been experimenting new technology such as blending ceramics with computer 3D design, and the use of 3D printing techniques. I received my B.F.A from Otis Parsons Art Institute and a M.F.A from the University of California, Los Angeles. 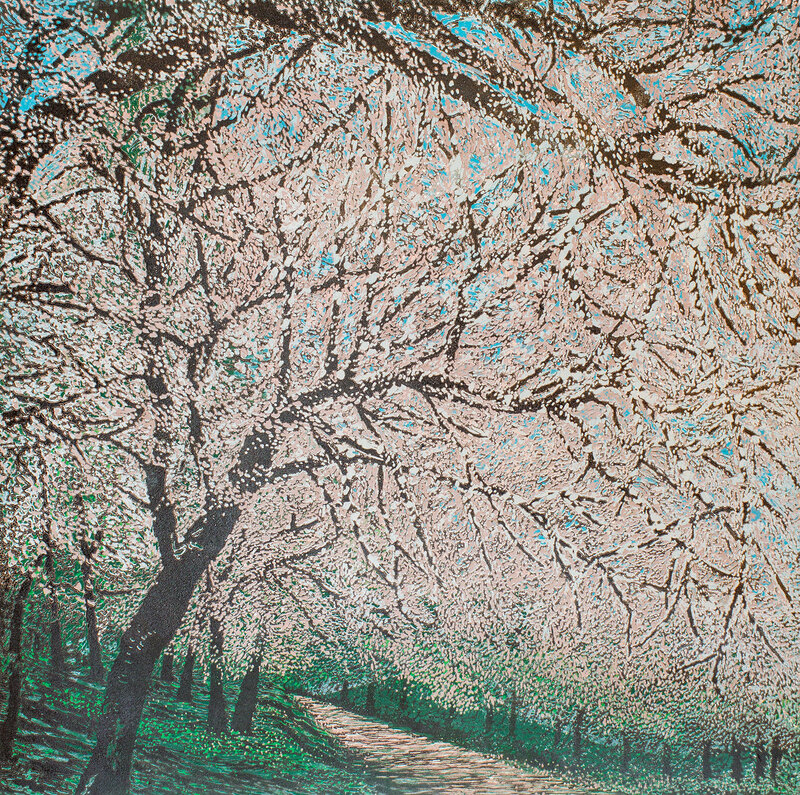 After I graduated I went to Japan as an Artist-in-Residence in Shigraki, Japan. Upon return from the orient I opened an art studio in Los Angeles. 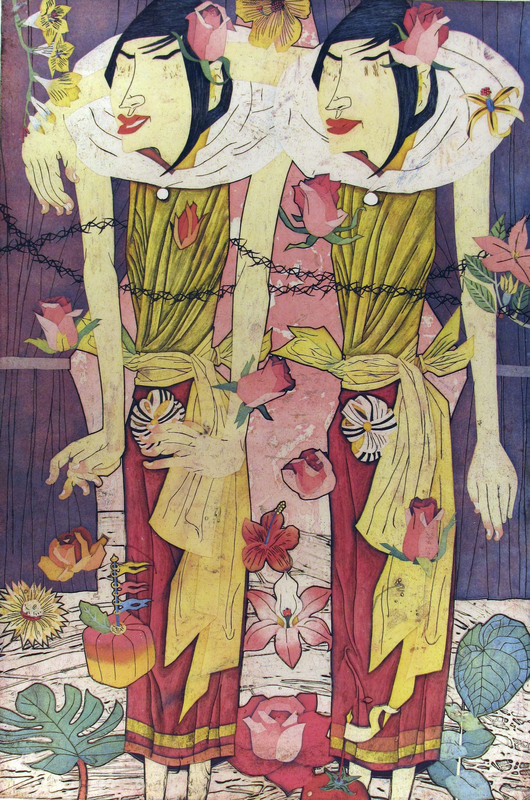 My work has been exhibited internationally and can be found in collections throughout the United States, Canada and Asia. I’m currently working on a commission that will be going to Istanbul Turkey. I have taught ceramics at the college and university level for over 15 years throughout Southern California. I have owned two galleries; Miller Fine art, and Miller Durazo Contemporary Artists Projects, which was designed to showcase young emerging talent. Currently, I hold the position of Associate Professor at Rio Hondo College and runs the art gallery and ceramic department. My ceramic design includes free form movement in clay that contains circular forms with mechanical strength and a flowing sense of movement. These mechanical shapes demonstrate strength and my focus is to elevate the clay static sculpture into a more free flowing design. I have an appreciation of art forms that include functional design. My focus has been to create ceramic art that can be used as vessels, containers, urns, water containers, bonsai pots and flower vases. 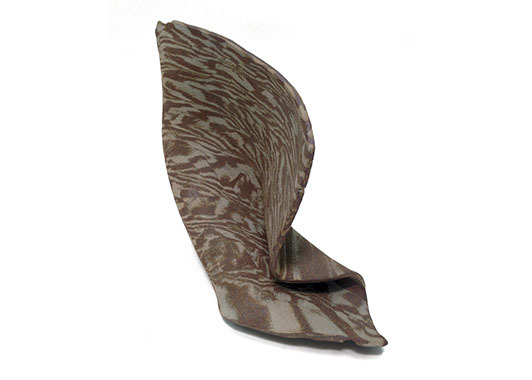 These ceramic art pieces have been sculptured by beginning with a wheel for a basis, and then almost every piece has been hand sculptured to create my functional art pieces with a depth of color. My vision and often my design work are inspired by my childhood, studying Sumie-e the 2000-year-old art form of Japanese ink brush painting. Monks practiced Sumi-e brush painting to train themselves in concentration, clarity and even spiritual intensity. 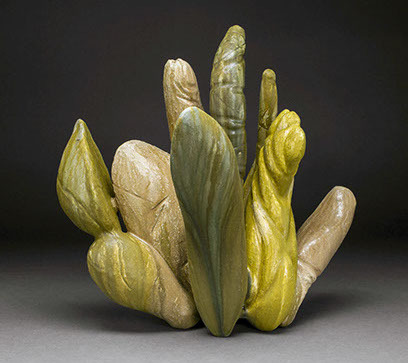 The meditation aspects of Sume-e enhance the creative process. 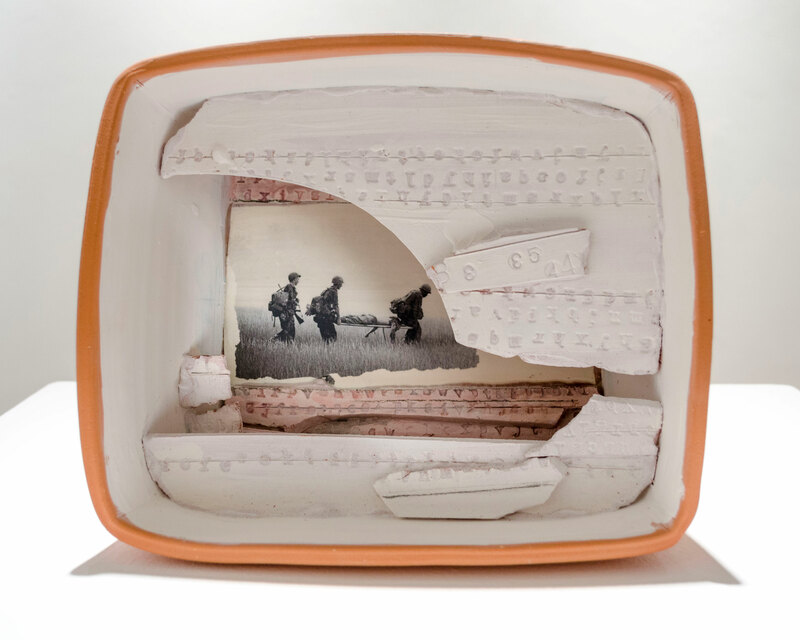 The diminutive stature of the work is chosen to create a sense of intimacy and protectiveness. Utilizing this invitation to intimacy I pierce, puncture, or otherwise open a form, implying a psychological interior, with the intention of pulling you closer. 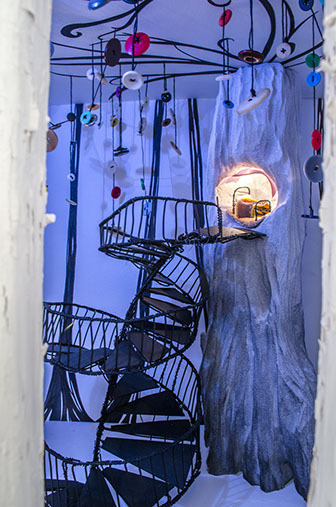 While I reference geological and biological entities, providing recognizable building blocks to a story, I intend the ambiguity of their relationships so as to provide the viewer room to participate in the sculpture’s interpretation, an experience in which the viewer steps into the gaps and participates in the object’s reason and meaning. Building on the relations amid intimacy, familiarity, and novelty I encourage artist, artifact, and audience into moments of play. In my Crushing Nickels Into Quarters series, I draw from 1980s video games, Meso-American architecture, and Minimalism to make sculpture that refers to times of transition and change. 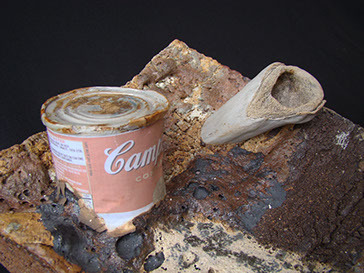 I give material to the immaterial by using clay, creating monuments to the signposts in my life. Through this work, I seek to connect to others who have had similar experiences of great upheaval and change. 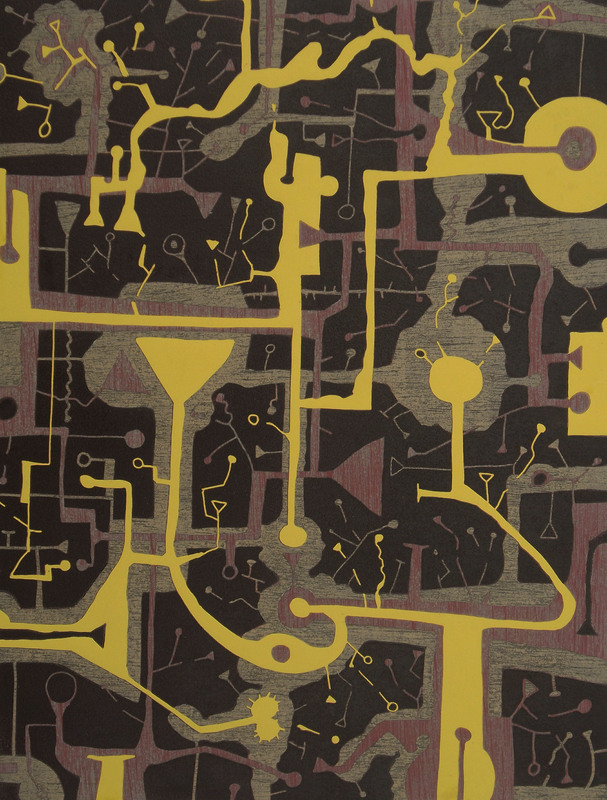 The Mid Century movement emphasized minimalism by simplifying forms to their organic essence. Microscopic expressionism reveals shapes and patterns, such as the structure of diatoms, which complements this idea to me and looks otherworldly. My goal is to create artifacts that bridge the organic and man-made /the natural world and a speculative futuristic world. 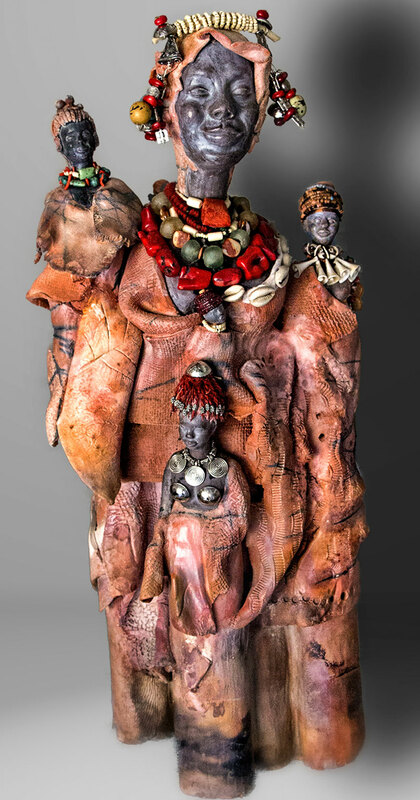 My sculptures are about relationships: person to person, person to society, person to the earth and its environs. Some of the work represents the feelings churning within us that are seldom shared with others. A new body of work, in development, explores the importance of diversity in a community. In the world, and even in our own country, there is so much anger and strife created by single minded groups endeavoring to impose their beliefs and life styles on those around them. Yet, it seems that our greatest strength comes from the blending of cultures, life styles and genetic codes. 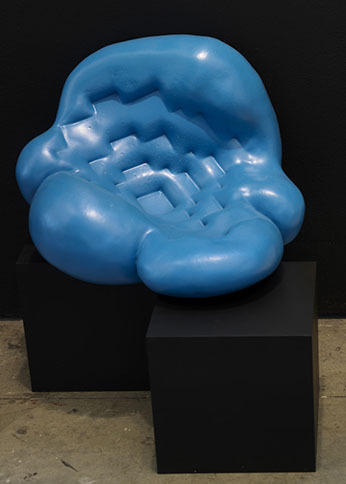 These pieces bring together diverse forms, textures and colors to produce a unified sculpture greater than the sum of its parts. I have been inspired by organic forms and contour lines throughout my artistic life. I love their sensuality and femininity. I always return to these elements whenever I go off in other directions with my clay work. They are my roots in both two dimensional and three dimensional forms. My pots are three dimensional drawings whose subjects are usually plants in my garden. I have a strong connection to my garden as I raise the plants, often from seeds, and care for them through the seasons of their lives. I draw and photograph them at all stages.I work in porcelain on the potters wheel. Its smooth surface compliments the organic forms I favor. I derive great satisfaction from drawing onto and carving into a porcelain surface. I can anticipate how the glazes will help to enhance the piece by pooling and flowing over the pot. This anticipation is like a fluid dance in my mind. I always look forward to working on my next piece and incorporating new ideas. I am obsessed with letters and numbers for their abstract qualities -- not necessarily spelling out anything. They are timeless suggesting a palimpsest, a prayer, a whisper, a mantra. 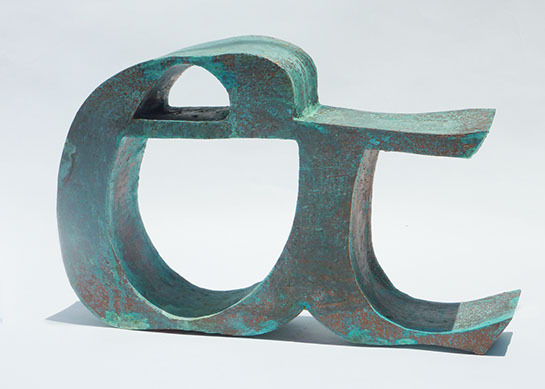 My forms are simple and sculptural giving a nod to their utilitarian ancestors. With my experience as a programmer and an artist, my art work focused toward software technology and technology vs. nature as the topics I would like to explore. Emotionally, I want to break away from technology or software related objects, but use languages and culture to express nature and humanity. Therefore I use ceramic as the material in my art work. I found the style I most related with is installations with simple form and color, but roughly repetitive with decorations and geometric patterns, which falls into post-minimalism style. To bring the sense of technology and not forgetting about the nature and the environment, most of my works are in earth tones or with the colors and shapes that reference historical objects. 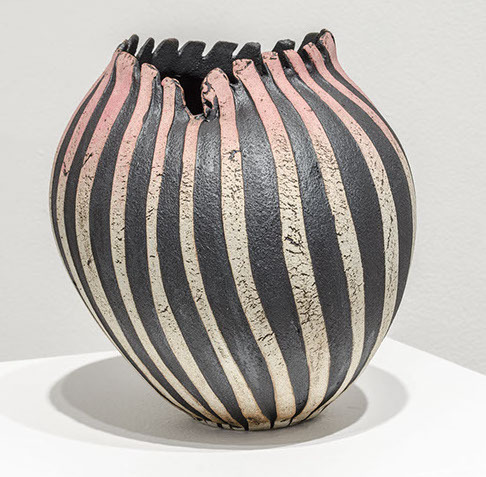 Since not until the modern era had ceramics began to be considered art or materials for installation, it is one of the benefits of using ceramics to create unique modern art. 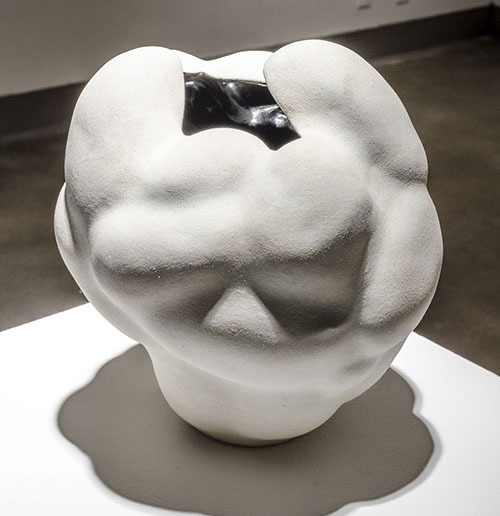 The style and the aesthetic of ceramic can be combined with traditional and modern elements in a dramatic and settled in a way taking the advantage of the gap between modern art making and the traditions. This is a favorite quote of mine, which also defines my journey as a ceramicist: the yearning for that sun: the visual solution in clay. I am deeply aware of my Pacific Islander background from the island of Guahan (Guam), and explore the history, myths, legends, and traditions of the island. I remember watching an Oceania segment on TV where it was mentioned that there is no word for art. I realize that my particular island is hit by typhoons and much can be destroyed. Guam is known for its weaving and carving, is there not art in these pursuits? Then I read recently that there is no word in Oceania (Micronesia, Polynesia and Melanesia) because an “artifact” is a Western concept. Painting, sculpture, carving, weaving and maybe even tattoos are actually an integral part of social and and religious aspects of daily island life. That’s how I would like to create in clay. Not working in a medium as special projects, but because the imagery is part of my personal story, something I see every day. Maybe the clay journey incorporates function and form and selects from my past and present. I make what’s in my head because I don’t see the same experience elsewhere. 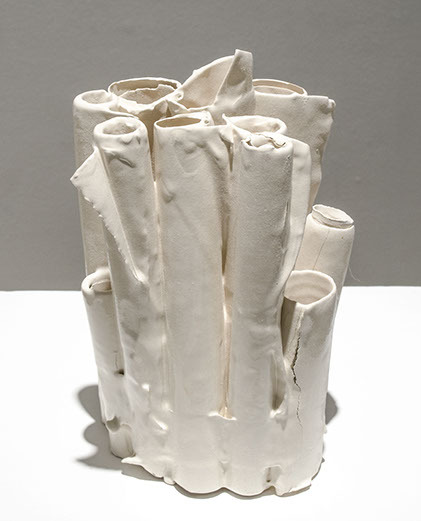 The great designer Massimo Vignelli was quoted as saying, “lf you do it right it will last forever.” Maybe the clay piece I make may not last, but the thought that once it existed will last forever. 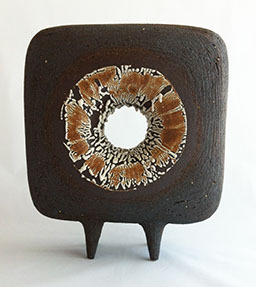 The ceramic pieces are made using an old Japanese technique called neriage or nerikomi, in which different colored clay bodies are layered to build a grid pattern. 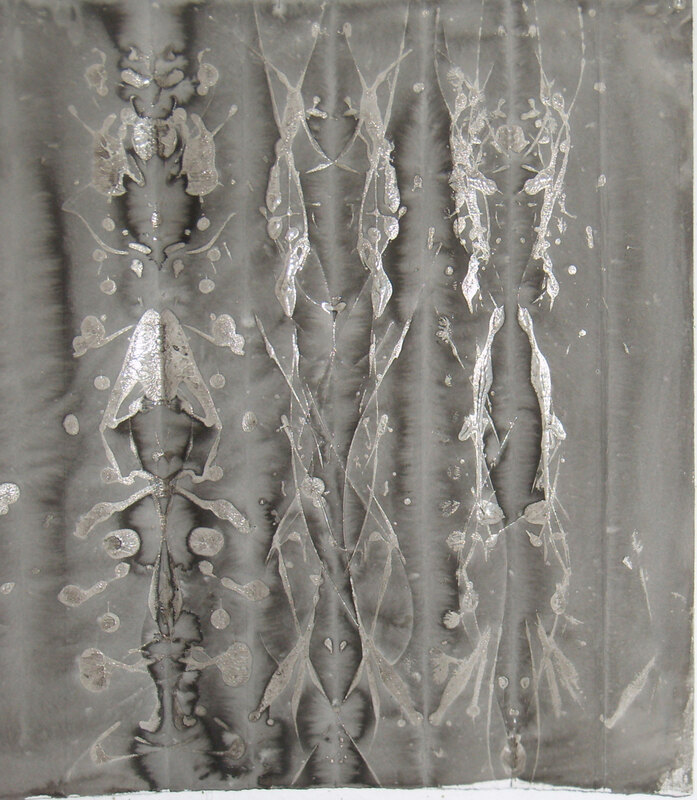 The grid is distorted as the clay slab is laid over an armature that holds its drapery-like form. The two natural colored clay bodies are unglazed and un-pigmented. Consequently, the pushing and pulling of the grid is not a skin on the exterior, but rather visual evidence of the physical distortions of the clay itself. 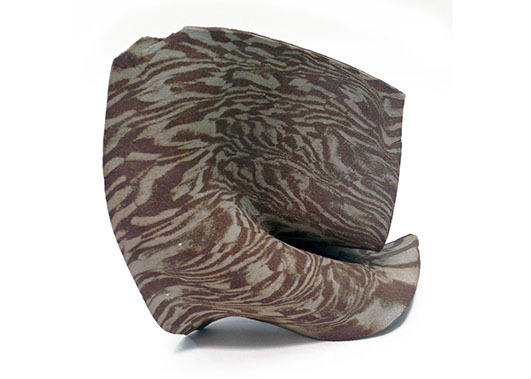 The marbled folds are reminiscent of Devonian colored sandstone and Hungarian red nodular limestone statues from the Romanesque period. 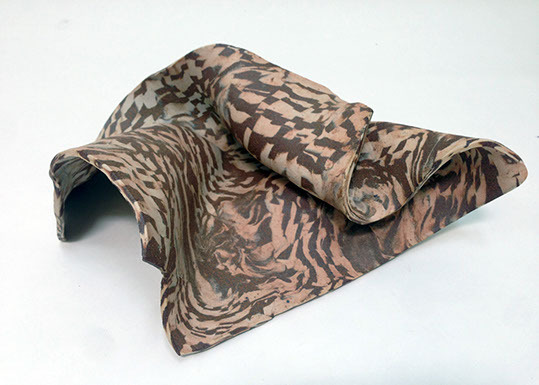 The folds recall cloth adorning an absent body, or the topology of an undulating landscape. The ceramic bowl is made through the same process of nerikomi, yet because it is a pinch pot it links back to the most ancient methods of creating a vessel. The exterior unglazed black and white clay bodies are combined with a deep blue glazed interior to reference the detail and color scheme of Oriental pottery. I hope in these pieces to start a conversation about who were are, what we value, and what we leave behind. 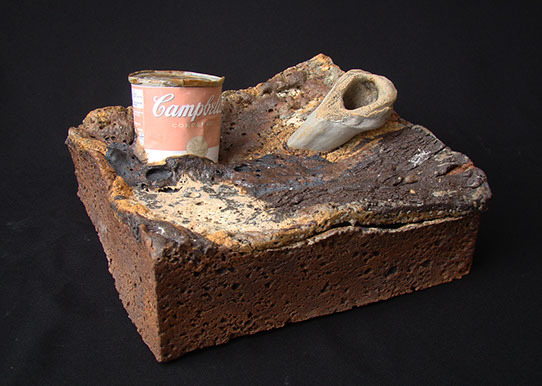 As a ceramic artist, I strive to push the edge of clays possibilities as a medium. Much of my inspiration comes from nature, and this series was the result of exploring Hawaii’s lava fields. 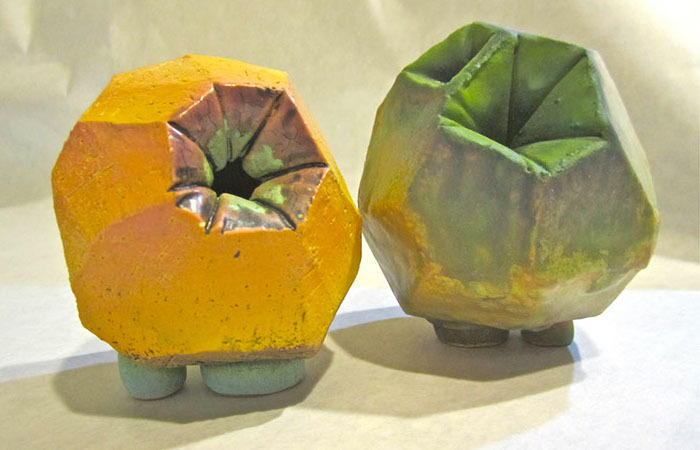 I experimented with a variety of clays and texturing techniques, as well as unusual glaze materials, to achieve the effects you see here. Hopefully, viewing these pieces will allow you to reflect on your own lives and how our present culture will be perceived by future generations. Jeannie Denholm has been active in the art business for over 30 years and has an extensive background assisting corporations and private collectors with art acquisitions, collection management and curatorial services. She worked for The Broad Art Foundation as Assistant Curator fur Special Collections from 1993-2003. 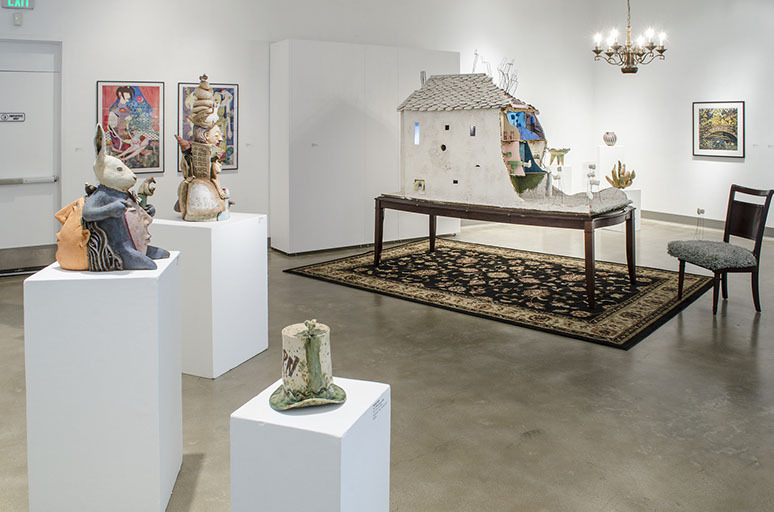 She established Southern California Art Projects and Exhibitions (SCAPE) In Corona Del Mar, CA In 2003 where she continues her work today as co-owner, curator of exhibitions and private art advisor. Her educational background includes a Bachelor's Degree (BA) in Art History, graduate studies in Art History at York University in Toronto, Canada, and a Master's Degree (MA) In Museum Studies and Exhibition Design from California State University Fullerton. 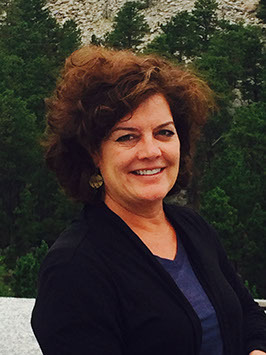 Denholm is a Board Member and Vice-Chair of Programs for the Phyllis and Ross Escalette Permanent Collection of Art at Chapman University She is often an invited guest speaker on the arts, taught Professional Studies for senior graduating students at the Laguna College of Art and Design, and has been a guest curator for a number of public exhibitions. 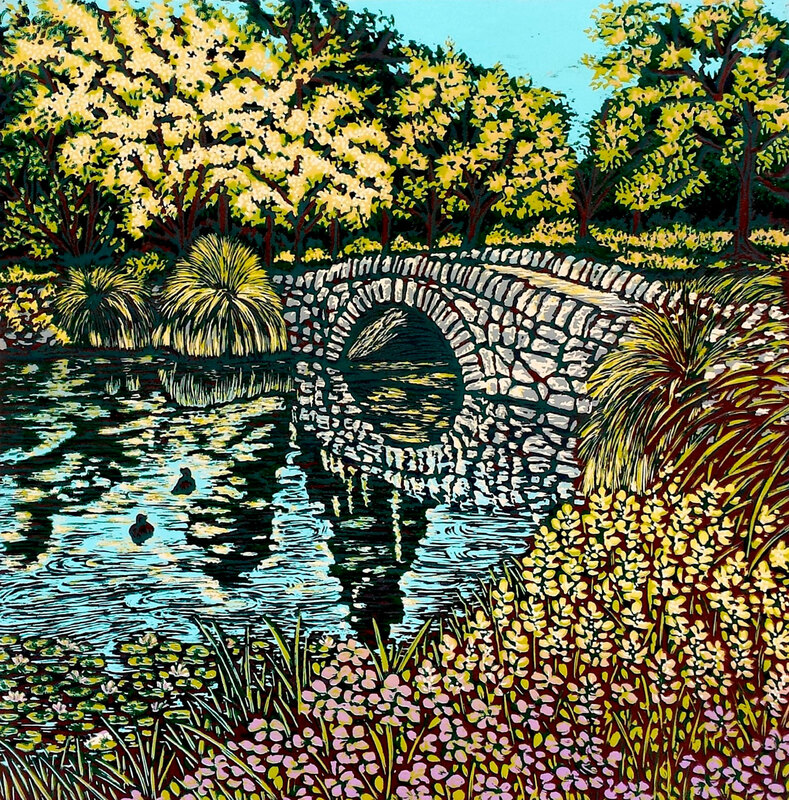 Raised in Canada, Phyllis Green moved to California to pursue graduate studies in art. 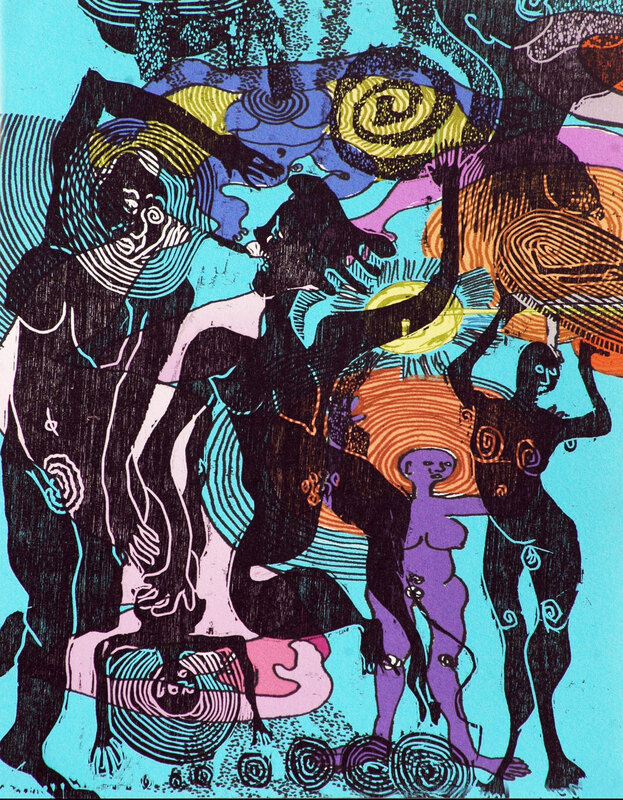 In 1978, her work was exhibited in the 4th Annual Ink and Cay exhibition. She received an MFA from UCLA In 1981, and began her professional career as an artist, educator and curator in Los Angeles. 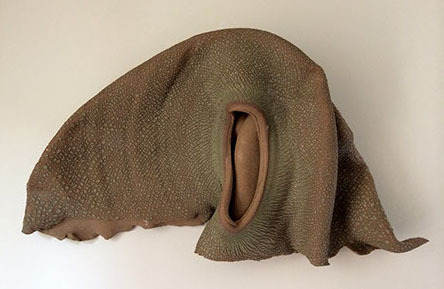 Her practice integrates gender politics, the sphere of craft and influences of Modernism. Green is primarily an object maker who represents the body. Over thirty years, these bodily surrogates have taken the form of skeletal fragments, organs and containers. She often incorporates day with other materials to create mixed media sculpture and installations. 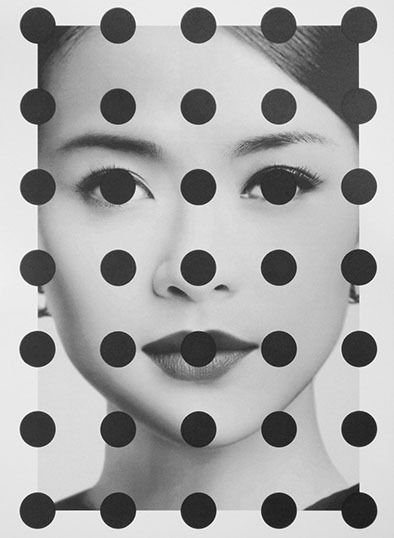 Green’s work has been exhibited extensively in exhibitions nationally and internationally, including From Head to Toe: Concepts of the Body in 20th Century Art, Made in California: Art Image, and Identity, both at LACMA, and Fiction@Love at MOCA, Shanghai. 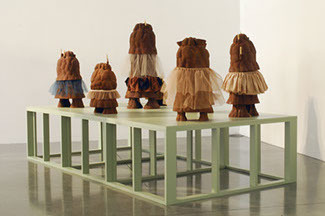 A survey exhibition titled Splendid Entities: 25 Years of Objects by Phyllis Green was presented at Otis College of Art and Design, Los Angeles in 2011. 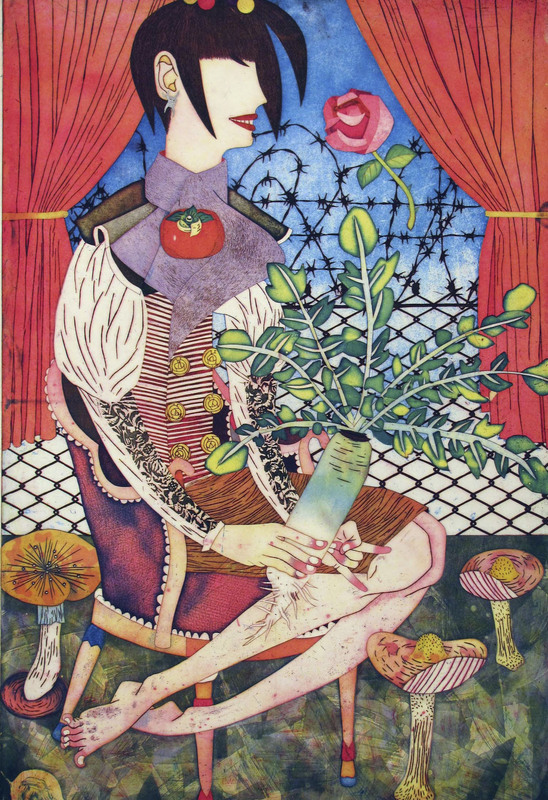 She is the recipient of individual artist’s fellowships from the National Endowment for the Arts, the California Arts Council, and the Pollock-Krasner Foundation; and was among the first group of artists to be awarded a C.O.L.A. grant by the City of Los Angeles In 1996. She produced and hosted a radio show on the visual arts, LOOK/hear, on KXLU: 88.9FM from 1996 to 1998. She was appointed to the Santa Monica Arts Commission in 2000, and elected Chair from 2004 to 2006. 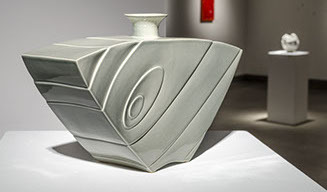 Green served as Guest Curator for Scripps College 64th Ceramic Annual In 2008. In 2010, she received project grants from the City of Santa Monica and the Durfee Foundation. 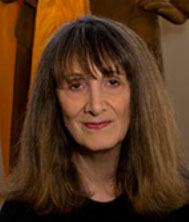 She was named a Fellow in Fine Arts by The John Simon Guggenheim Memorial Foundation in 2014. Green has lectured in colleges and universities worldwide and has held teaching positions at UCLA and Loyola Marymount University in Los Angeles. She is currently an adjunct faculty at the Roski School of Art and Design at USC and Deputy Director of The Christopher Isherwood Foundation. 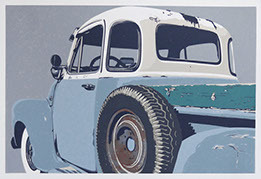 Dimensions: 84" x 120" x 72"
Dimensions: 35" x 18" x 20"
Dave Lefner is a native-born Angelino, who, for the last 15 years, has lived and worked in his studio at The Brewery, the world's largest artist colony. 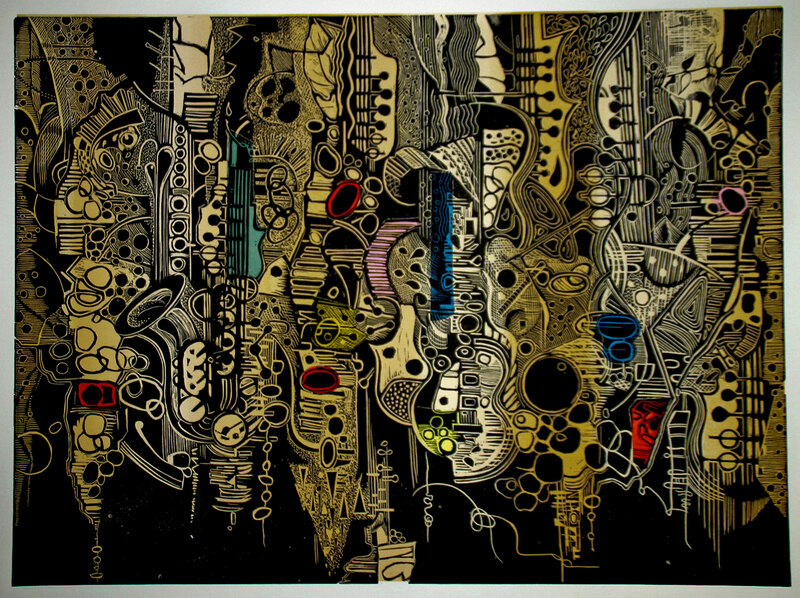 He received a BA in Art from California State University Northridge, where he discovered a love of typography and its many faces, the graphic prints of the German expressionists of the 1940s, and, his biggest inspiration, Picasso's series of linocuts from the 1950s. 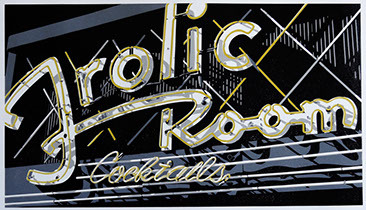 His work reflects the beauty for the city that surrounds him with a nostalgia for its aging, but unique storefronts, signage and architecture from all areas of Los Angeles including the Valley, glamorous Hollywood, and especially his current home in Downtown LA. 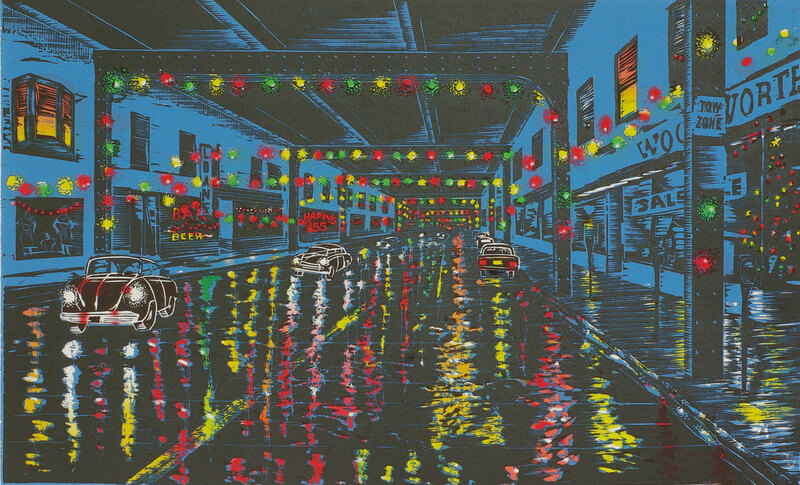 The urban landscape, complete with its burnt-out, broken neon signs, its faded and peeling movie posters and billboards, its web of power-lines and telephone wires overhead, and the occasional intricately-painted graffiti piece serve as the perfect inspiration for his detailed, very limited-edition, reduction linoleum block prints. 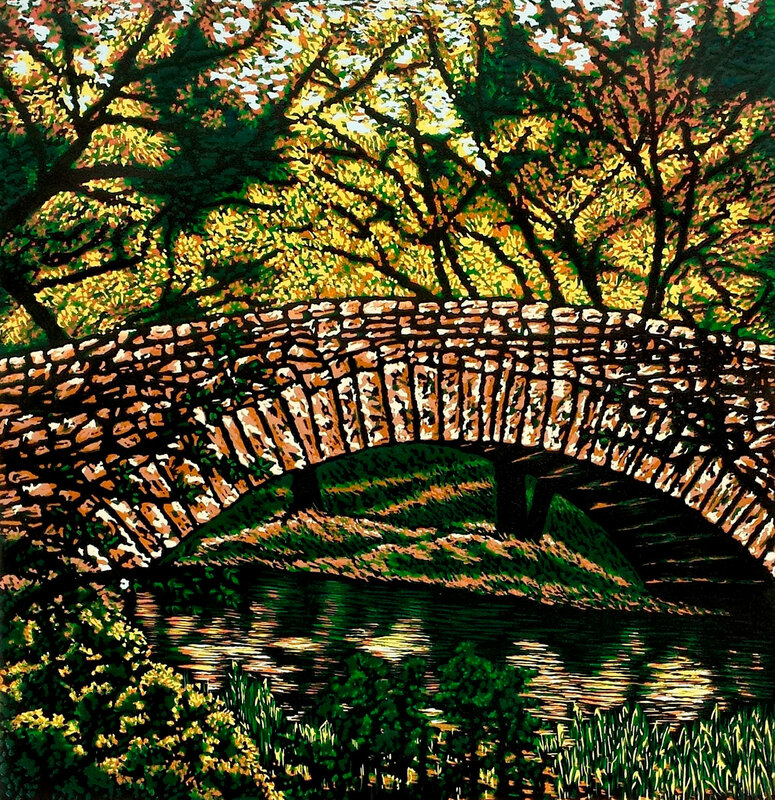 For over twenty years, Lefner has dedicated himself to preserving and perfecting what seems to be the dying artform of reduction block printing. Because of the immediacy of today's world, this technique is being lost in the face of a digital age. But It is the mystery of this labor-intensive process that intrigues him most. There is no room for error as the piece slowly reveals itself through a series of carving/printing stages from a singe block of linoleum. To him, the journey is definitely as important as the destination. 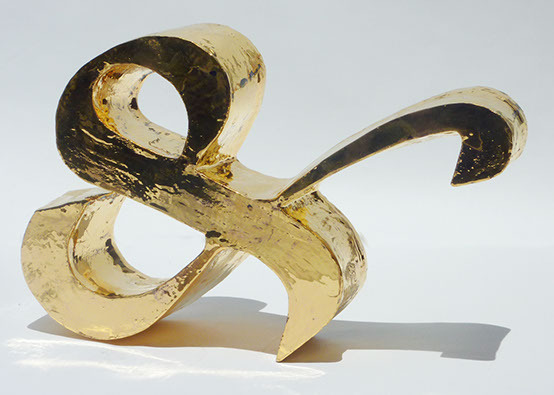 The Kellogg Art Gallery is pleased to offer $8,000 in cash awards this year. This includes (2) $1,000 Purchase Awards: The James H. Jones Memorial Purchase Prize, generously sponsored by Mr. Bruce M. Jewett, and the University President’s Purchase Award, sponsored by the Office of University President, J. Michael Ortiz. Remaining awards include (11) $500 Juror Awards and (5) $100 Director's Choice awards. 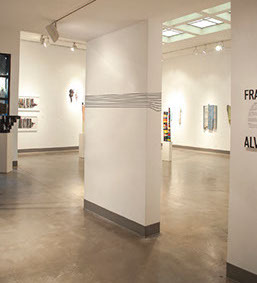 Tour the gallery in this video created by Preston Haerr for this year's exhibit of Ink & Clay 40. Also view the slide show (right) of the reception held on September 13, 2014 by clicking the left and right arrows.